Those who follow our updates know that the new building has absorbed much attention – and much of our donated funds. This building is so important beyond the 44 children who reside at The Rolling Hills Residence. 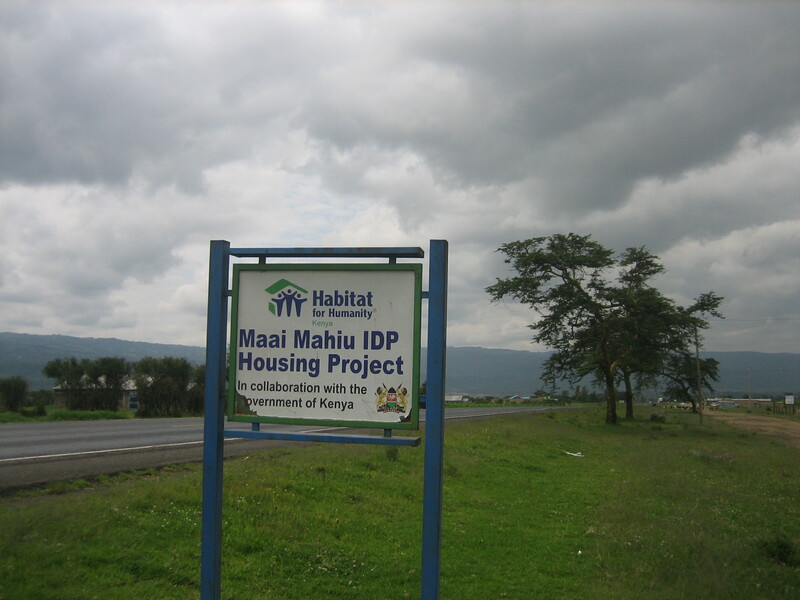 It is the ‘tip of the iceberg’ as this building is becoming the epi-centre of all charitable projects within the Mbooni region. It is being constructed to move towards self-sufficiency. The biogas plant on site provides fuel for cooking and the construction on the top floor is for use as a conference centre which will be rented out for community functions, with that rent going towards the ongoing support of the program. Listed below are schools that have made donations and as well as the ways that this money was spent. Often we ‘hold onto’ the money for a number of months while we designate it to specific tasks. This summer all available money was spent to move the new building to the point where it is getting close to completion so I have listed the schools fundraising efforts and the way the money was used in the same sections. Rolling Hills Public School in Bethany Ontario, under the guidance of Abbie Wright, has been the school that has raised the most money for our program. The original building was named in their honor and now with the construction of the new building the name itself, Rolling Hills, is being transferred over. In addition part of this new building is being designated Diana’s Wing in memory of a teacher whose life was tragically cut short. This past year they raised $8022.36 in their annual Hoops for Hope Tournament. We are truly appreciative of their amazing support!! Here’s how the money was spent on our new building. 12 double steel doors @ $120.00 ($1440), 10 loads of sand @ $75.00 ($750), 3 loads of ballast @ $162.00 ($486), 5 water tanks @ $75.00 ($375), $1000 of plumbing materials, 30 boxes of floor tiles @ $15.00 ($450), 100 bags of cement @ $10.00 ($1000), and $2521.00 in labor costs. Ray Lewis P.S. 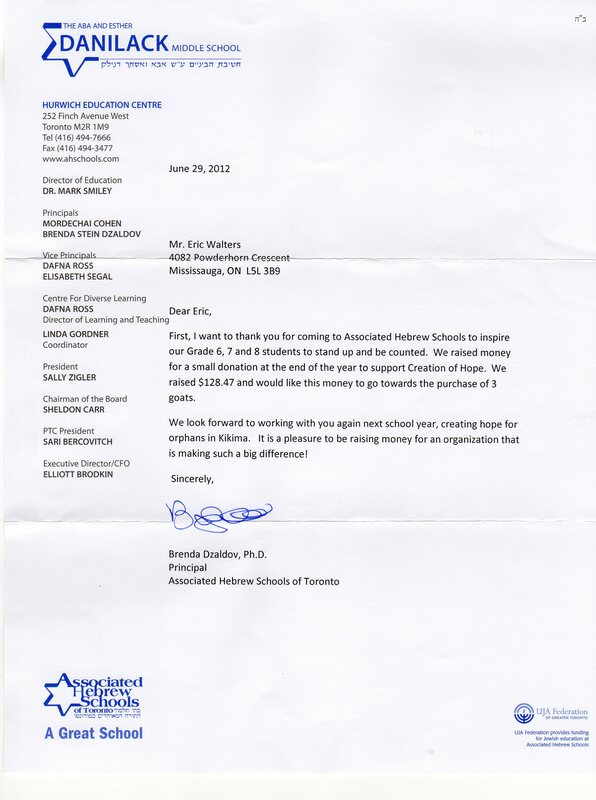 in Hamilton donated $1237.00. These funds were used to pay for 10 small window panes @$46 ($460), 3 large steel windows @ $73.00 ($219) 1 load of ballast @ $162.00, 10 boxes of floor tiles @ $15.00 ($150), and $246.00 in general labor costs. Neha Shah, a student at White Oaks P.S. donated $390.00. This money was used to purchase a large window pane for $51.00, 10 boxes of floor tiles @ $15.00 ($150), a water tank @ $75.00, and 12 bags of cement @ $10.00 ($120). 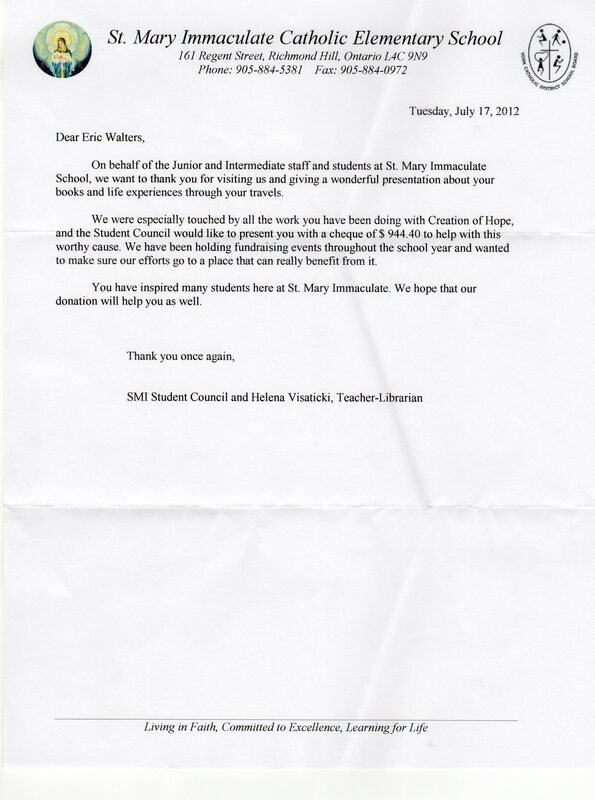 St. Paul’s School in Norwood, under the direction of Shirley Coughlan raised $660.30. This money was used to support the program for 11 days! St. Joan of Arc C.S. in Maple under the direction of Ms. Rustja raised $1086.92. These funds were used to purchase 5 loads of construction sand @ $75.00 ($375), 2 water tanks @ $75.00 ($150), 20 boxes of floor tiles @ $15.00 ($300), $201.62 in electrical fittings and supplies and 6 bags of cement @ $10.00 ($60). Queens University provided $380.00 which was used to purchase 38 bags of cement @ $10.00 ($380). Thanks to the fund raising efforts of Jack Hulland P.S. under the leadership of Sara Tillet. As requested these funds were used to purchase $1200 in textbooks for the school where our children attend. 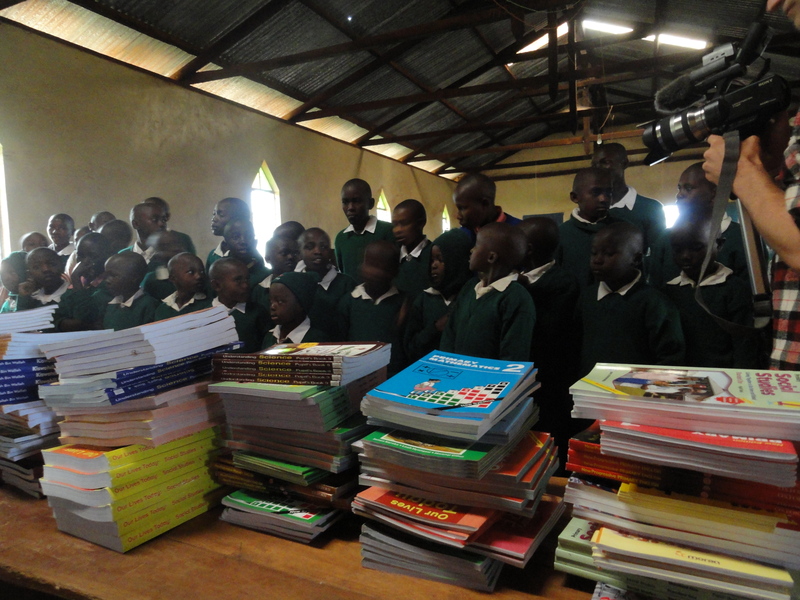 The amounts to between 5 and 7 textbooks per subject area for every grade 1 – 8. 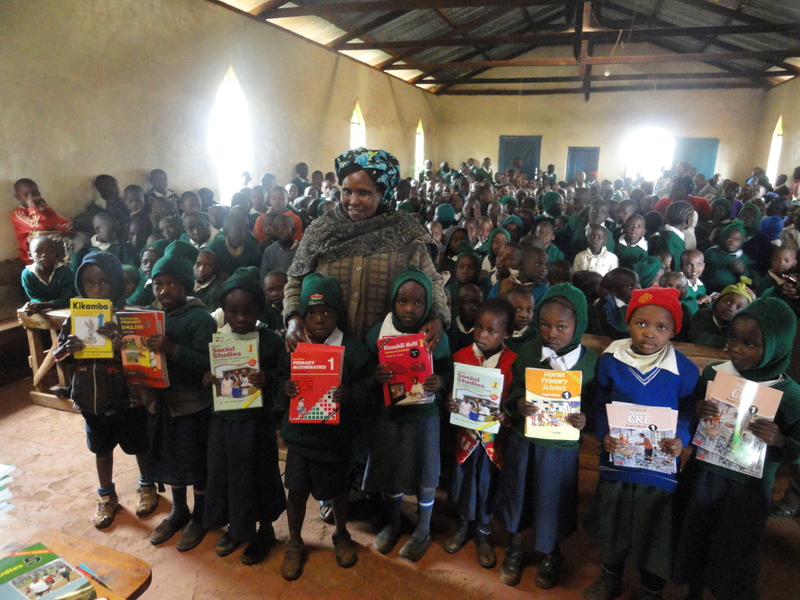 This donation more than doubled the texts books available at this school and will have long term positive effects on the education of children throughout this school for years to come. Fund Raising – Funds Spent! 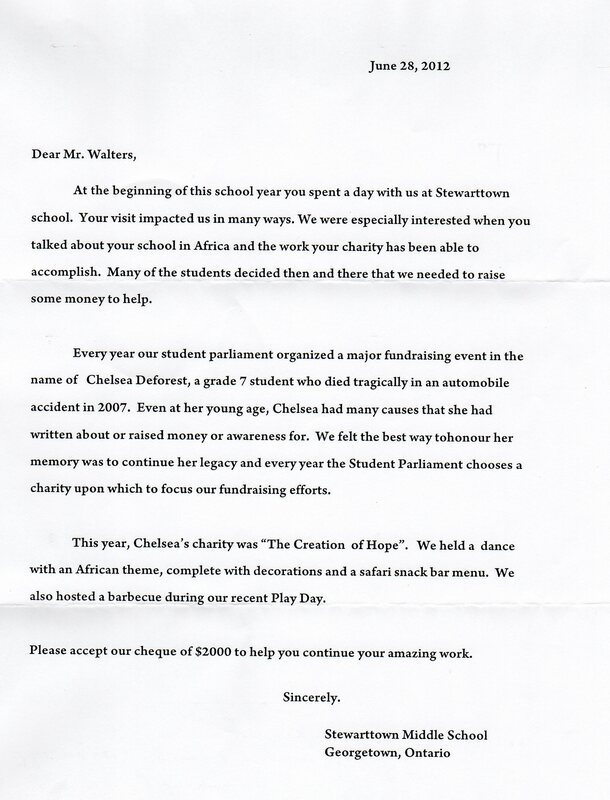 A donation from our Student Council. We look forward to reading how you can best use our donation this year! Stride School in Burnaby B.C. contributed $300.00. These funds purchased the glass for 5 windows @ $46.00 ($230) and 7 bags of cement @ $10.00 ($70). Ballantrae P.S. Aurora raised $742.92. The money was spent to purchase 5 small steel windows @ $45.00 ($225), 2 large steel windows @$73.00 ($146), and $371 toward the electrical wiring and fittings for the building. 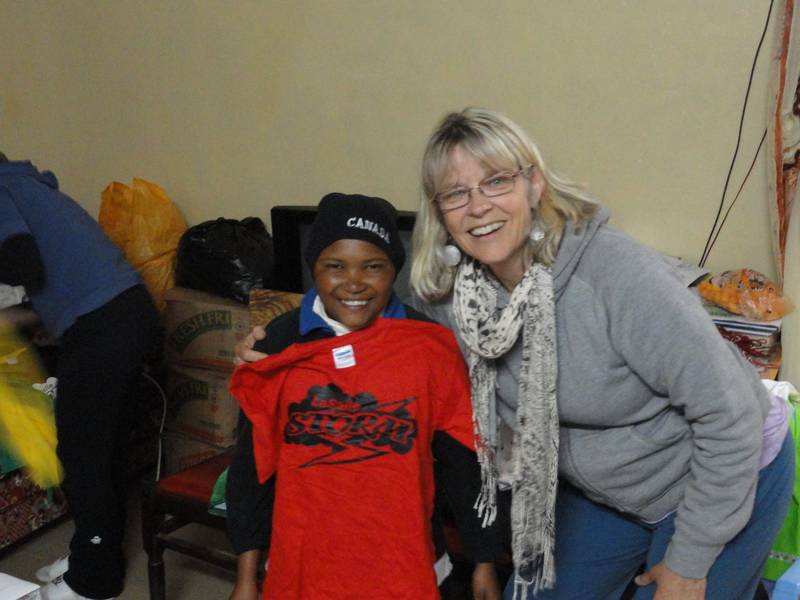 Grandview supported the entire Rolling Hills Residence for 1 day – the food for 44 children, school supplies, clothing, medical treatment, the salaries of the matron, night watchman, tutor, electricity, sanitation and water for the entire building! These funds were used to provide 5 large steel windows @ $73.00 ($365), 5 large window panes @ $51.00 ($255), and $324.00 for plumping materials including pipes and fittings. 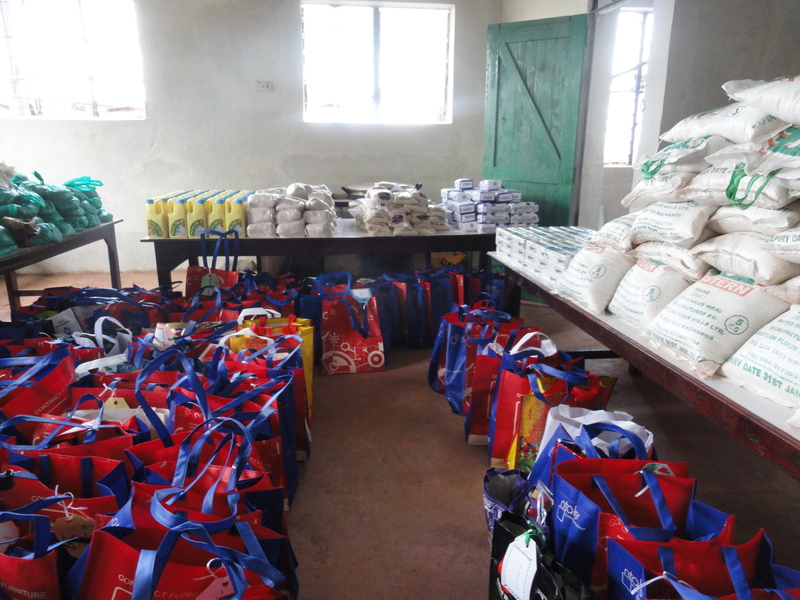 These funds were specifically donated to provide 23 orphans with blankets and 28 chickens to be distributed to orphans. 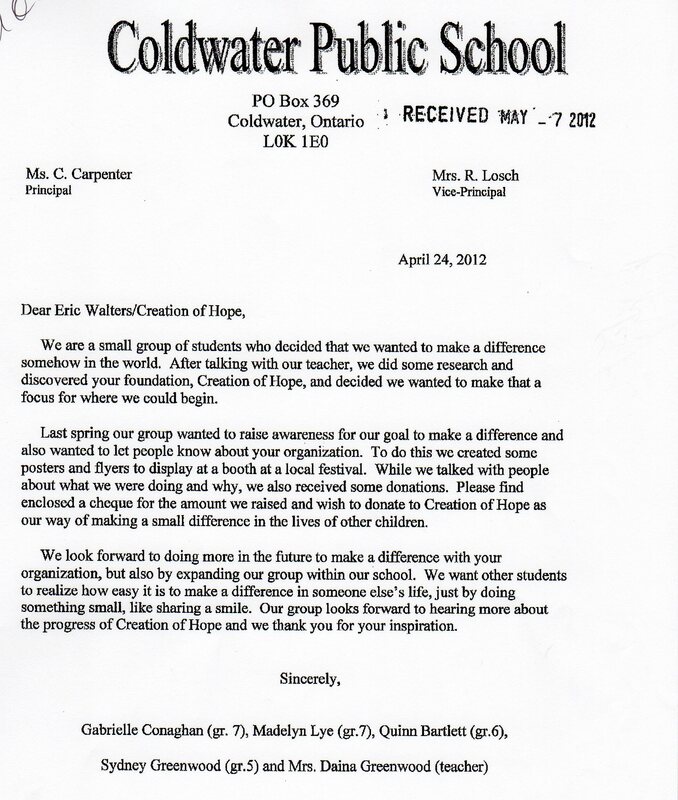 Pictures will be sent to the school – and displayed on our website – when these donations are finalized. The money raised by Coldwater students is being used to provide support for three days of the Rolling Hills Residence and to purchase 1 bag of cement @ $10.00 for the new building. 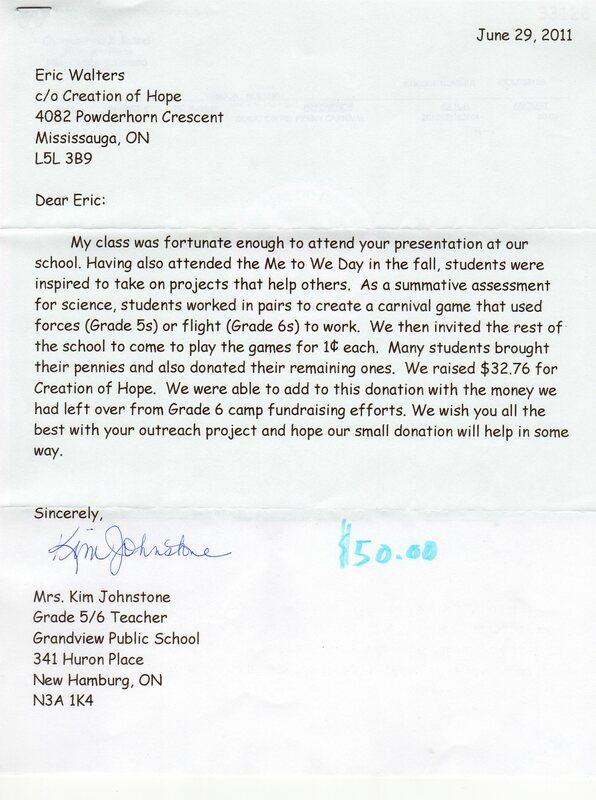 Fairview Public School is one of our most generous schools. 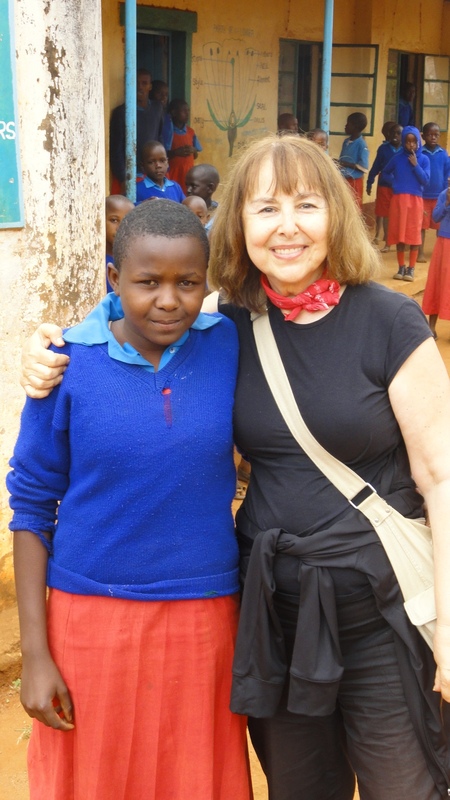 One of our sponsors, Lorraine Toma-Jones, teaches there but it is a full school effort. 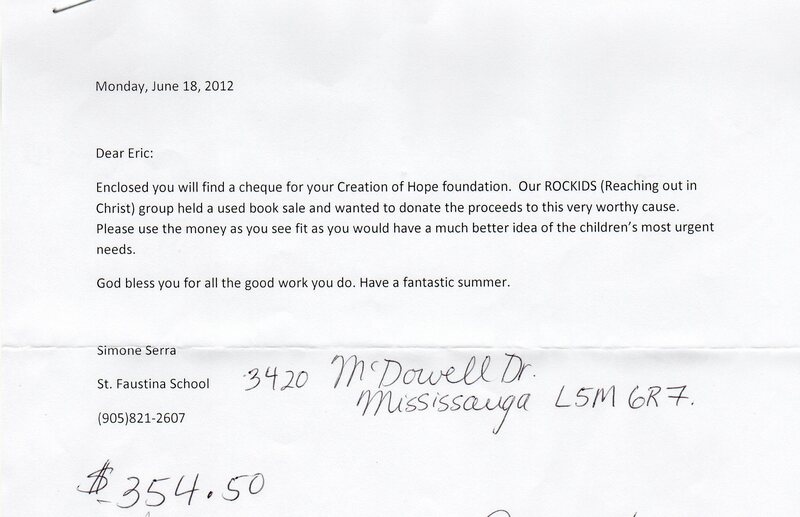 Once again they have contributed, this time, $2334.59. Their donation was used in the following way – 5 large steel windows @ $73.00 ($365), 5 large window panes @ $51.00 ($255), 1 load of construction ballast @ $162.00, 5 loads of sand @ $75.00 ($375), 20 boxes of floor tiles @ $15.00 ($300), and $877.59 toward labor costs. 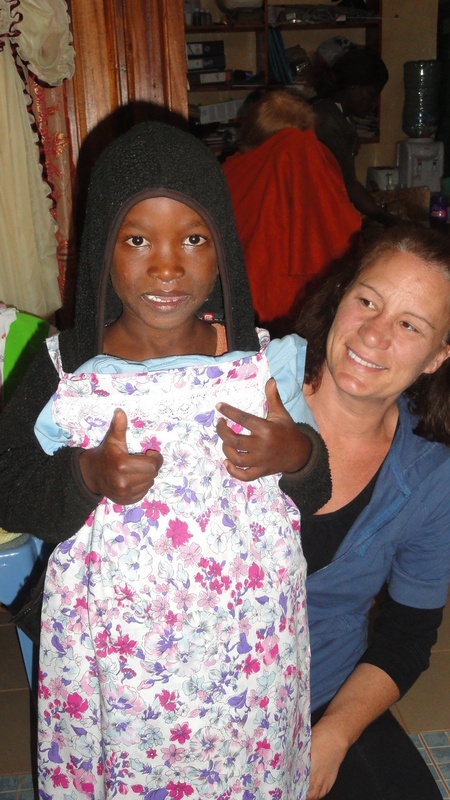 Samantha’s money went toward supporting the entire Rolling Hills Residence for 4 days! 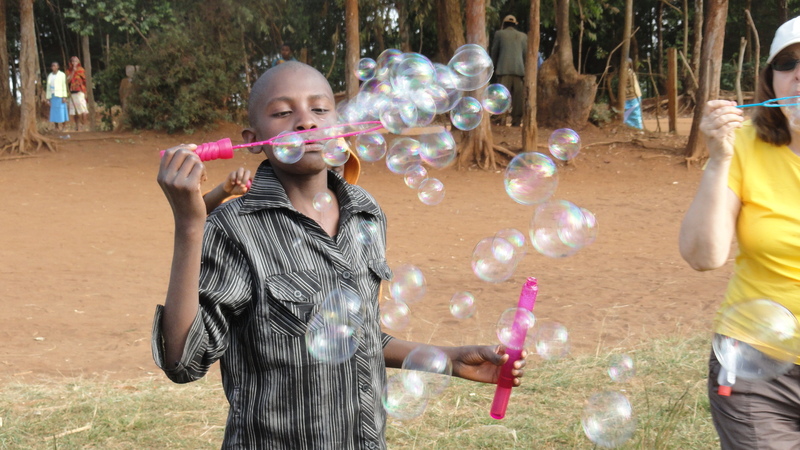 On behalf of Creation of Hope, the Hope Development Centre and the orphan children of Kikima Kenya, I would like to extend our sincerest thanks for your generous gift of 140 Giant Bubble Wands early this year. 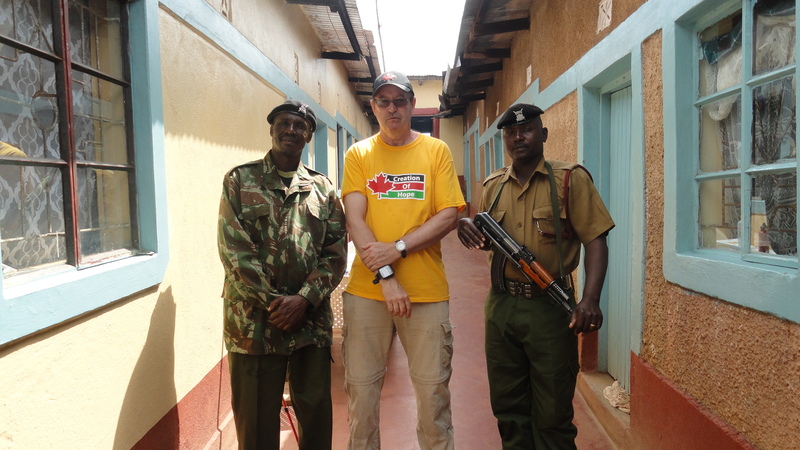 In July 2012, those wands were carried by Canadian sponsors into the Mbooni mountains to provide the orphans of this program with an afternoon of magic and entertainment. The wands came out after a rousing round of soccer in the field outside the local school. The temperature was moderate, the wind was light and the kids were completely taken by the bubbles. We’ve included an album of the best photos taken that afternoon in the hopes that you’ll get a sense of just how much wonder and joy you provided. Canadian Tire Burlington/Guelph Line and Hilda and Bill Line have also been formally thanked on the Creation of Hope website at www.creationofhope.ca. Again, thanks for your kindness. It means more than you know. Stephanie A. McManus LL. B. Employees of Aviation & General Security Consultants have been actively involved with our program since July 2010 when they made their first visit. 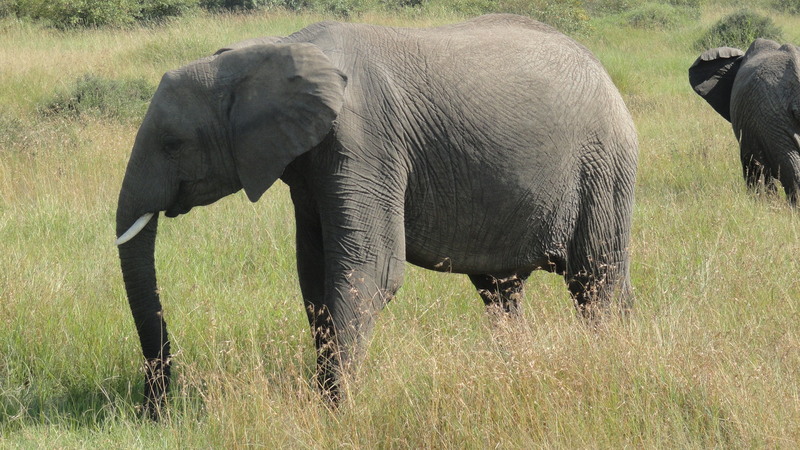 They come up to the program 3 times a year and always bring food – 20,000 Ksh worth – and other items. 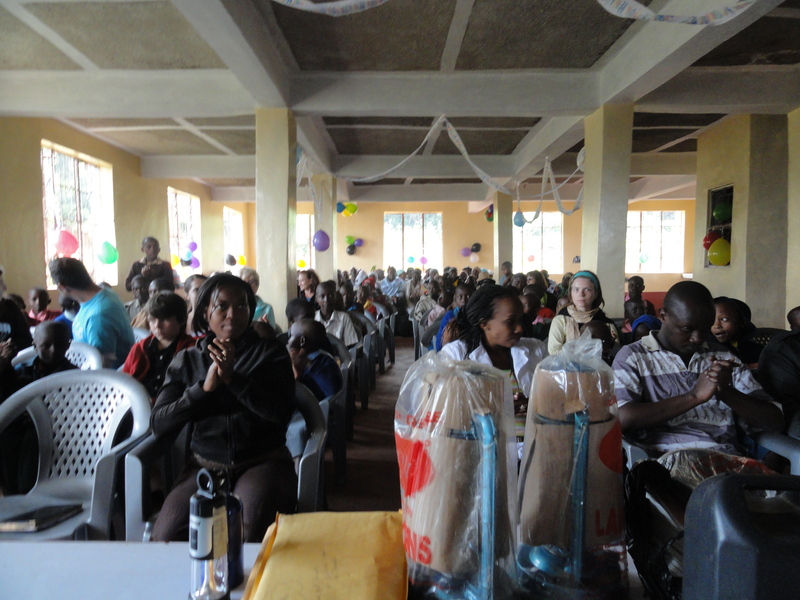 On this occasion they came and made a donation of 48,000 Kenyan Shillings which was used for windows in the new building. The people in this visit were, Danson Kioko, Iyona Kioko, Faith Wairimu, Esther Mwasambo, Irene Arupia, Benedict Nyaga, Wilson Masake and Humphrey Simiyu. 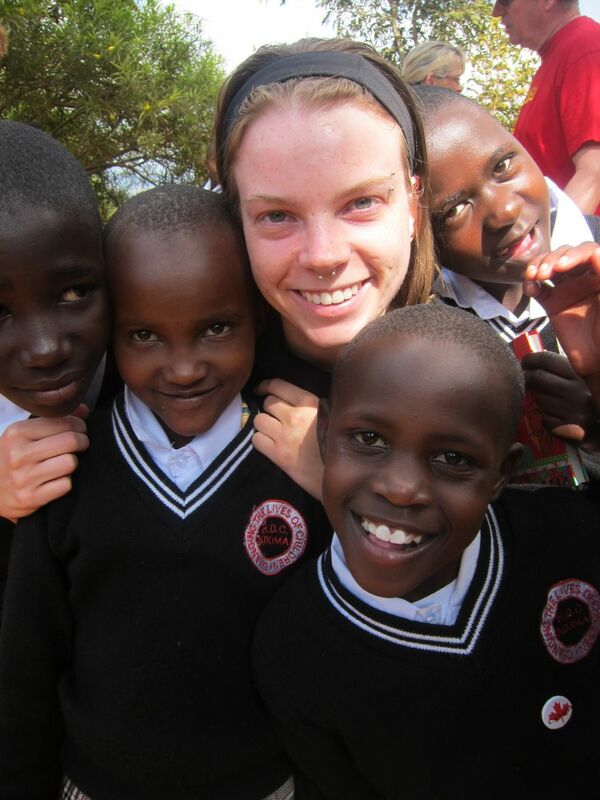 The support of Kenyans has become a hallmark of our program. AIM reports that we receive more than ten times the amount of money for our program that is usually hoped for from local sources. 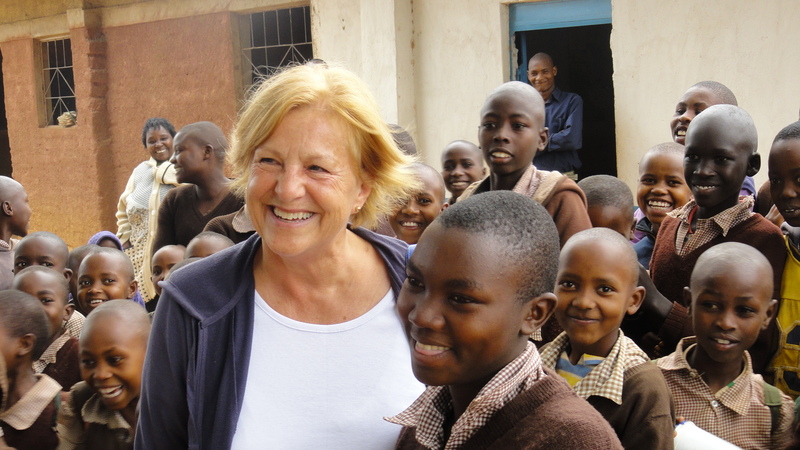 The people of Kenya realize that this program is ‘their’ program and have generously, frequently and continually contributed. This money was used to purchase 4 large steel windows @$73.00 ($292), and 6 large window panes @ $51.00 ($306). We also know how much it means to the children in our program that these wonderful people from SGGG come up to take part in ceremonies as well as give donations. 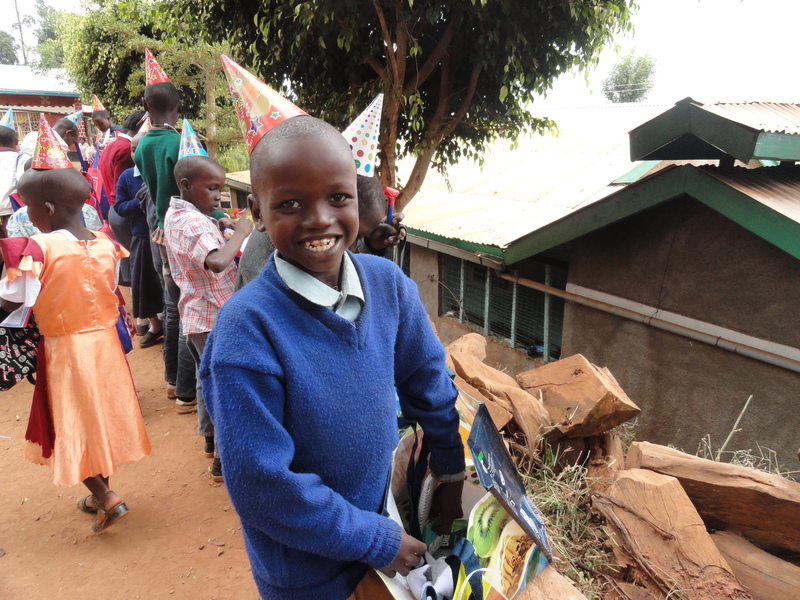 They joined us at the distribution day and birthday party and were part of the celebrations! In fact, I think they’re having as much fun as the kids! 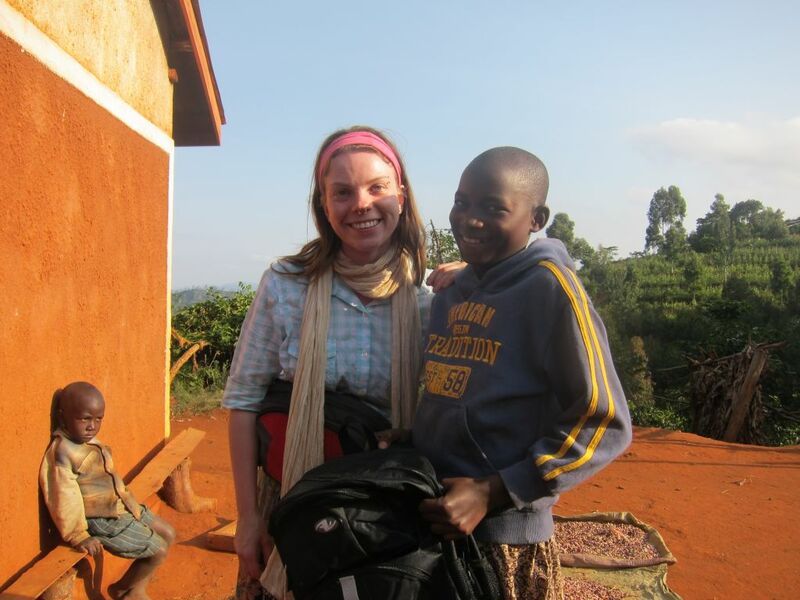 Ruth and Henry’s son Kioko is employed by the security firm and is always there when they come up to the program. 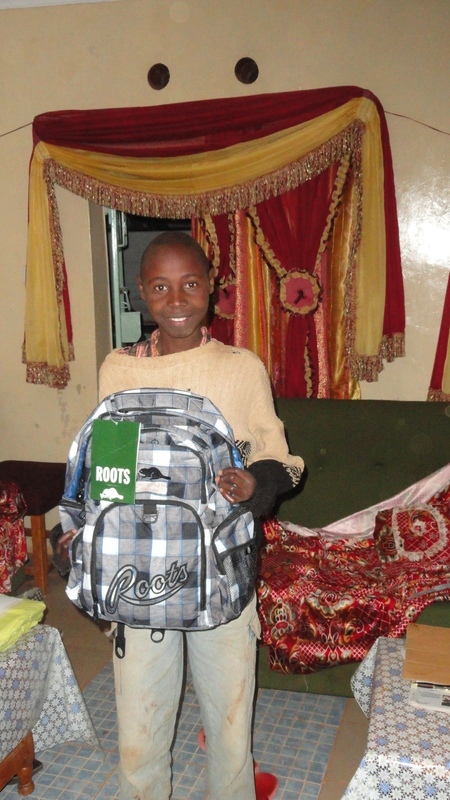 He personally donated 5,000 Kenyan shillings. This money was used to purchase material to put a roof on the stairwell. 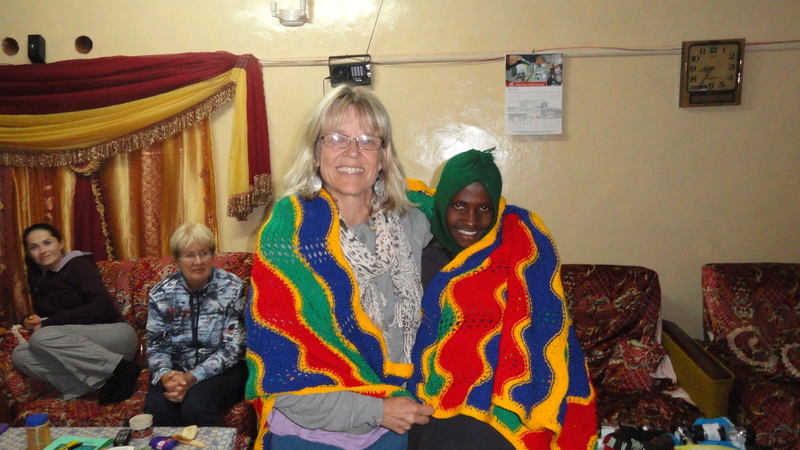 Tasleem Abdalla donated 5,000 Kenyan shillings. This money was used to purchase 6 bags of cement @ $10.00 ($60). 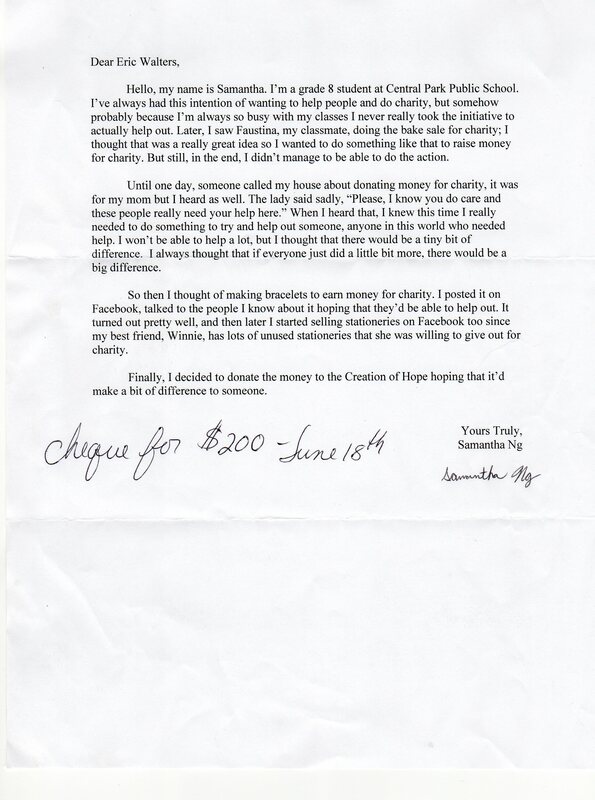 Beth McLaughlin donated $500.00. This money was used to purchase $200.00 of electrical fittings, 1 large steel window @ $73.00, 1 large pane of glass @ $51.00 and 16 bags of cement @ $10.00 ($160). Although doors, windows, cement, wire and tanks are not exciting purchases to some, they are the backbone of the building out of which our program will be run for many decades to come. 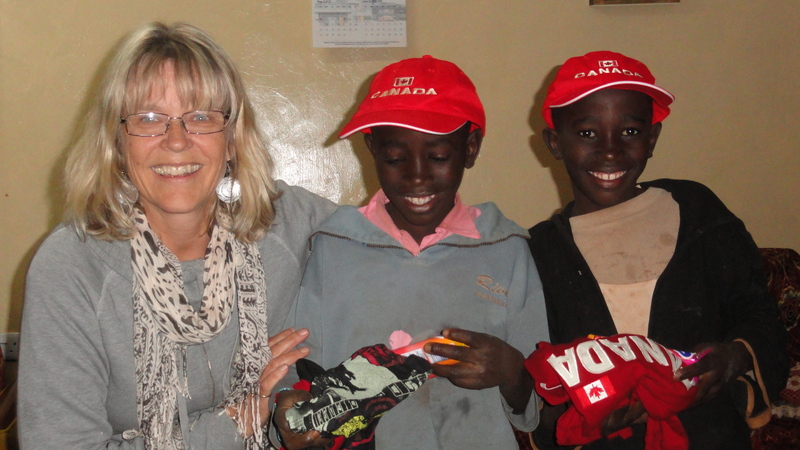 They are creating a legacy of serving the orphans to give them hope in their future. 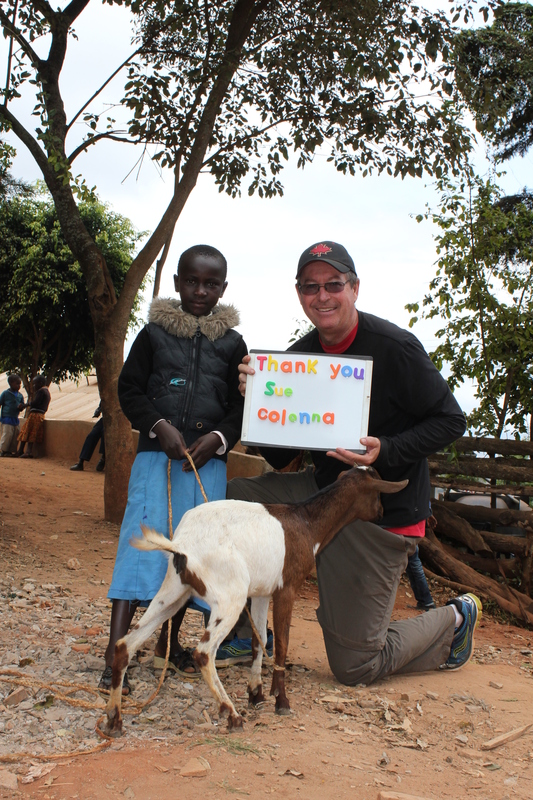 Thank you to all for your generosity in assisting to build this project and this dream! 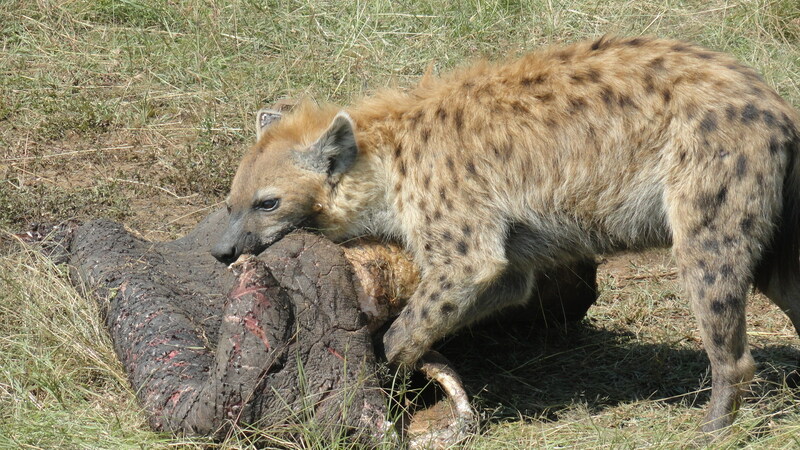 As always when I’m in Kenya I work on a story. 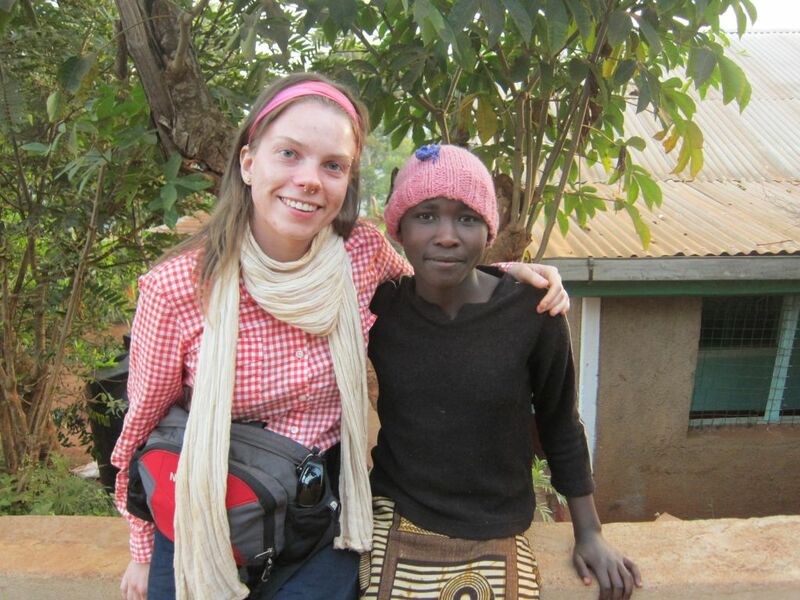 This story, Walking Home, is inspired by the tragic violence in Kenya in 2008 after the disputed Presidential elections. My main character is a 13 year old boy, Muchoki. He and his mother and younger sister, Jatta, flee to an Internal Displacement Camp (IDP) after the violence kills his father, other family members, and their property and possessions are all destroyed or taken. In the camp his mother, who has been suffering from malaria dies. 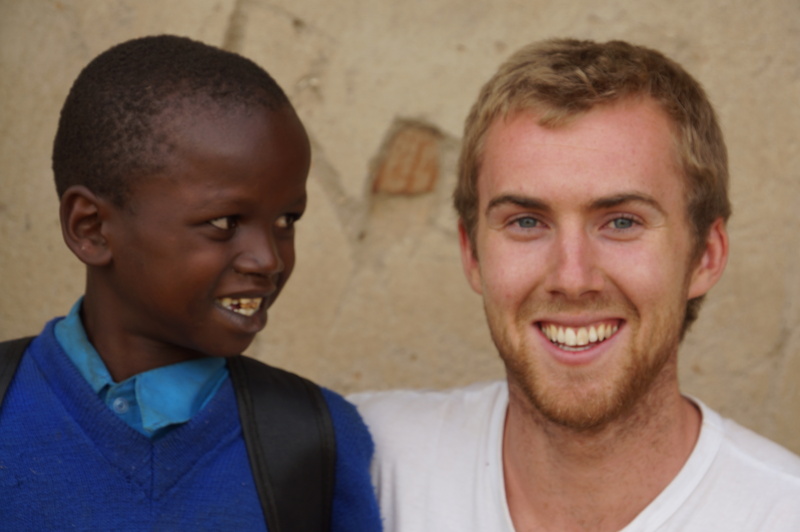 He takes his sister and walks 150 km across Kenya to find his mother’s family – grandparents he’s never met. As with other recent books I decided to experience what my character would experience. 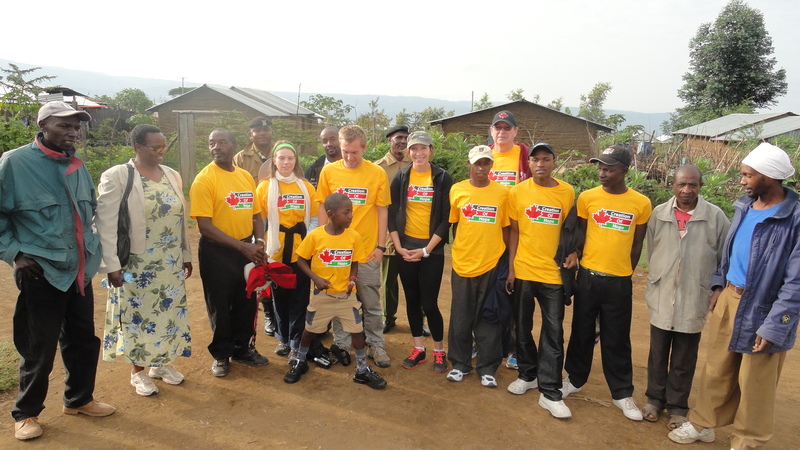 We started our walk – four Canadian young – Kate, Connor, Matt, and my daughter Julia – along with four children in our Children’s program – Matuku, Baraka, Mulwa and Keli – and co-led by Henry. The route we were following contained some dangers – both animal and human – so we also took along with us two guards; special forces police. 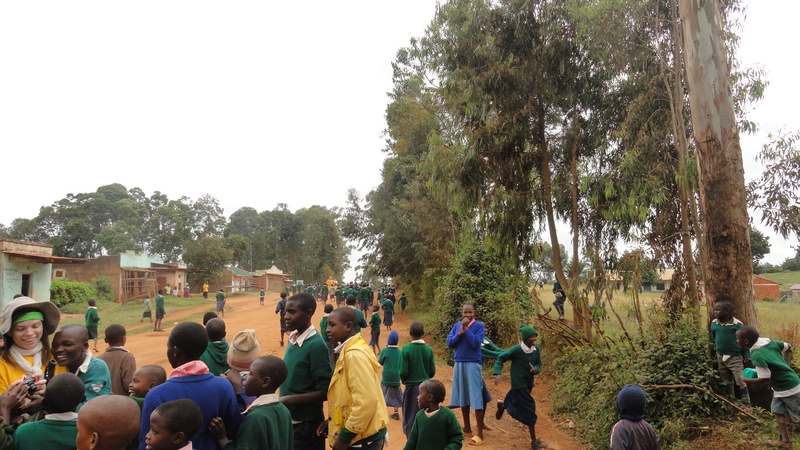 and continued up, out of the Rift Valley, where we stopped at The Robin’s Nest – an orphanage for children who have parents in jail and thus unable to provide care. This was a place of both hope and tragedy. Arrangements were made for Ruth to return to ‘compare’ notes on their operation. 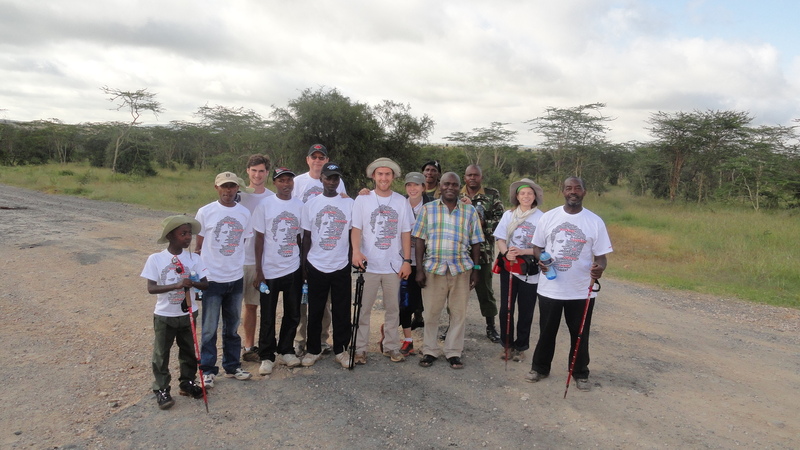 We continued on our second day toward Nairobi. Our third day started within a section of Nairobi called Kibera. It is the largest slum in Africa. It is estimated that there are 600,000 people who reside in an area no larger than a few square kilometers. They reside in metal shacks with no running water, no functioning sewage system or garbage disposal or in most cases even no electricity. 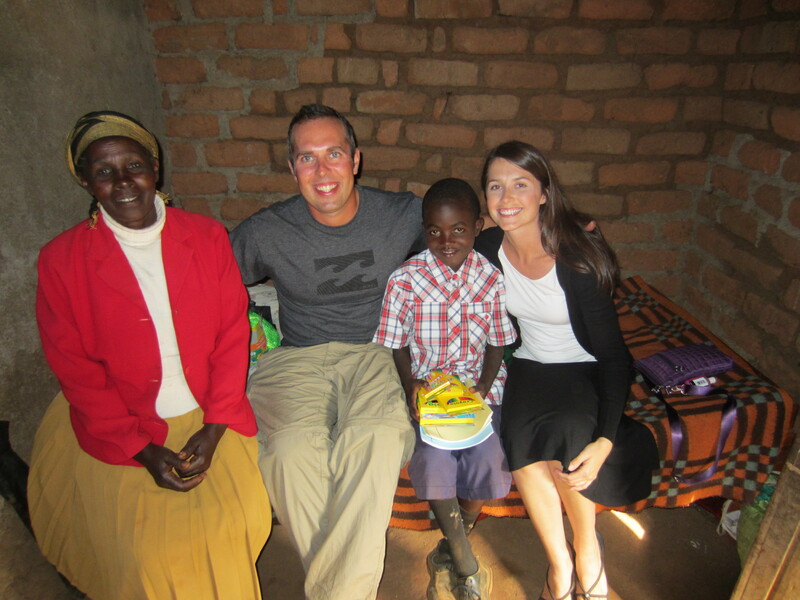 Within this small area, children are born, families raised, people do business, go to school, and worship. This experience was both disturbing and moving for all of us. Despite it all, the spirit of human dignity remains strong. Leaving behind Nairobi we went along the Mombasa highway heading for Machachos. One of those days – in honour of a great Canadian hero – we wore Terry Fox T-Shirts. This coming September all of the Hope children will do a Terry Fox Fun in Terry’s memory. 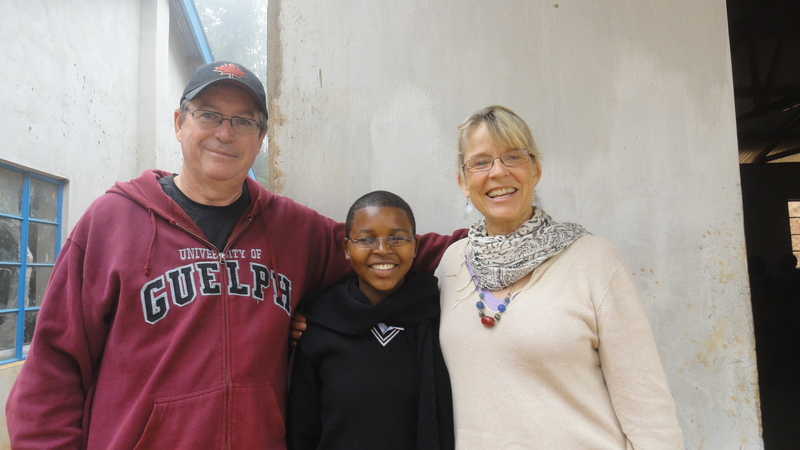 For two nights we visited at Suivi Children’s Home and stayed at the home of the Director, Reverend Nicholas. Finally our last day took us all the way ‘home’ to Kikima. 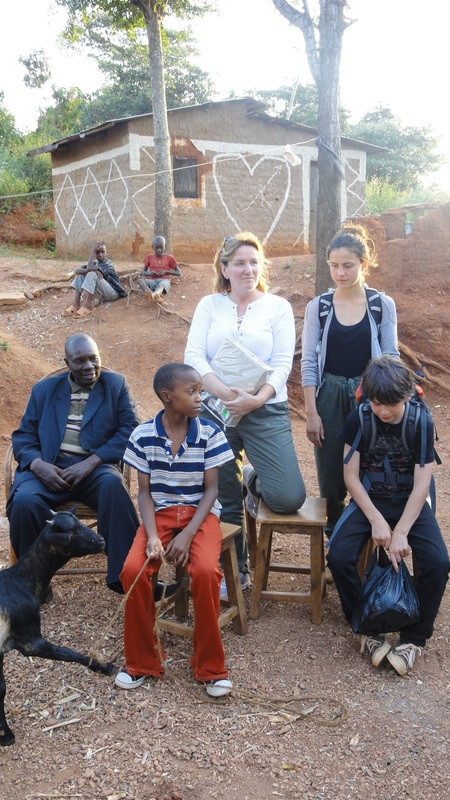 During the last part of our walk we were accompanied by the children of our residence – Rolling Hills. 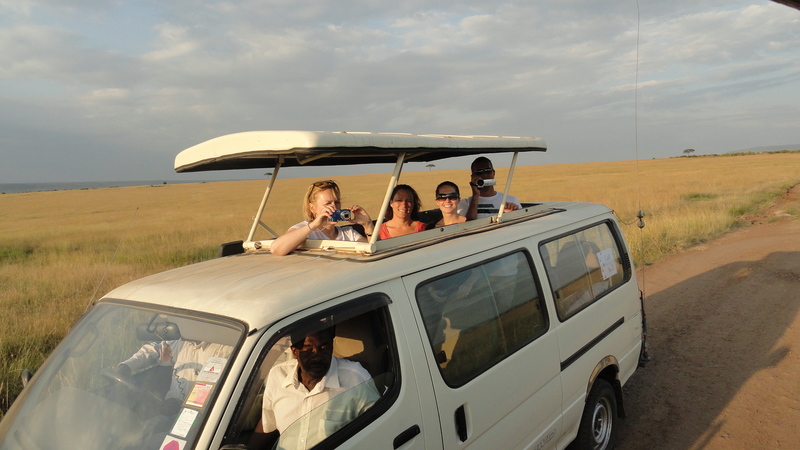 This entire trip was filled with thought-provoking, eye-opening experiences for all of us, seeing parts of Kenya none of us had ever seen before. The book, Walking Home, will tentatively be published in late 2013 or early 2014. 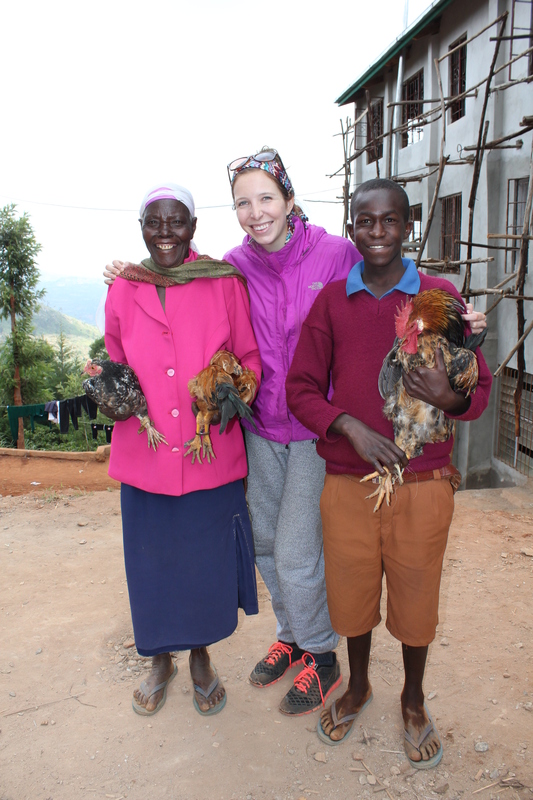 Ruth and Henry always say – ‘bring us more visitors’ – so this year we brought 19 people, all of whom are either sponsors or supporters of the program. 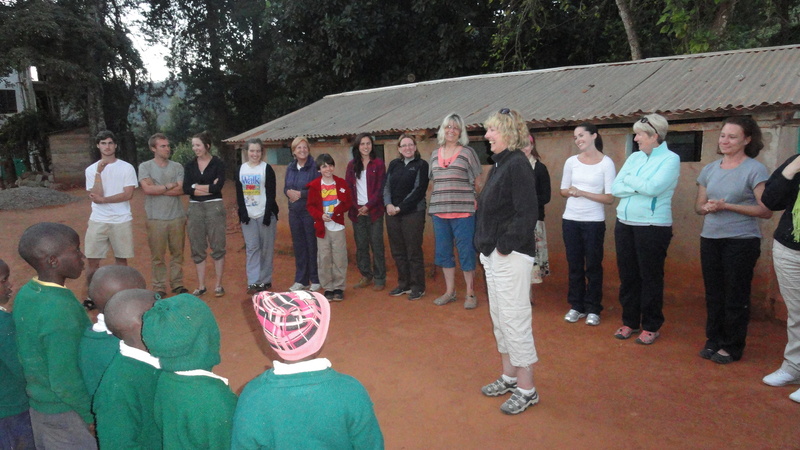 This initial meeting between the Canadian visitors and the children, was wonderful and there were very few dry eyes as the children offered greetings and song. 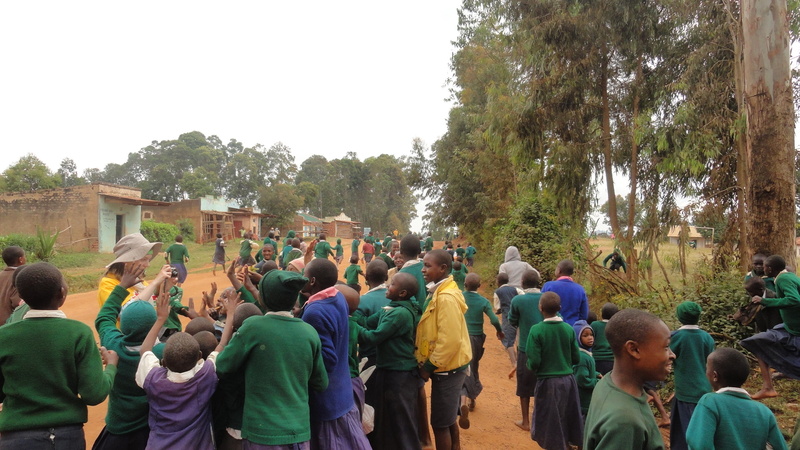 Quickly our visitors realized that they were much more than simply ‘guests’ but welcome members of a large extended family throughout Mbooni District. 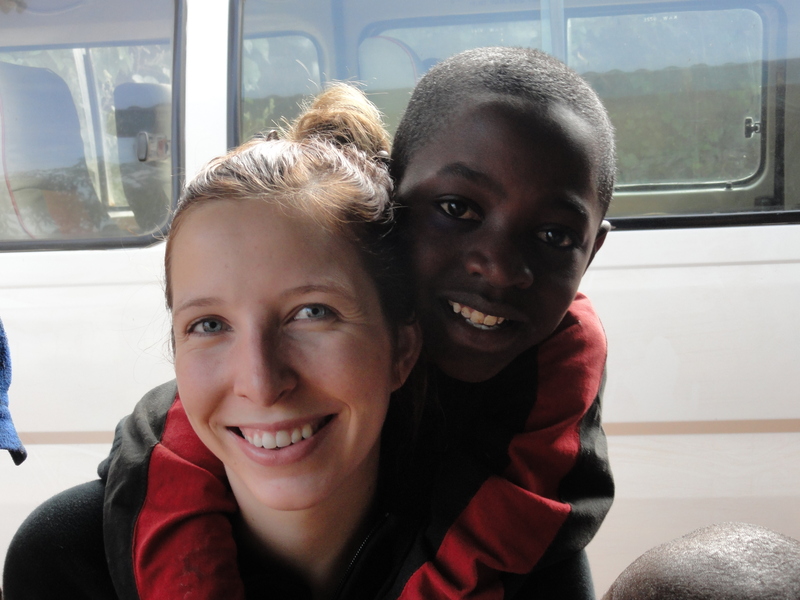 Our group had the opportunity to spend time in the program – living on the grounds of the Children’s Home, taking part in official ceremonies, meeting their sponsored child or children and visiting their homesteads. Below you can see pictures of those meetings. 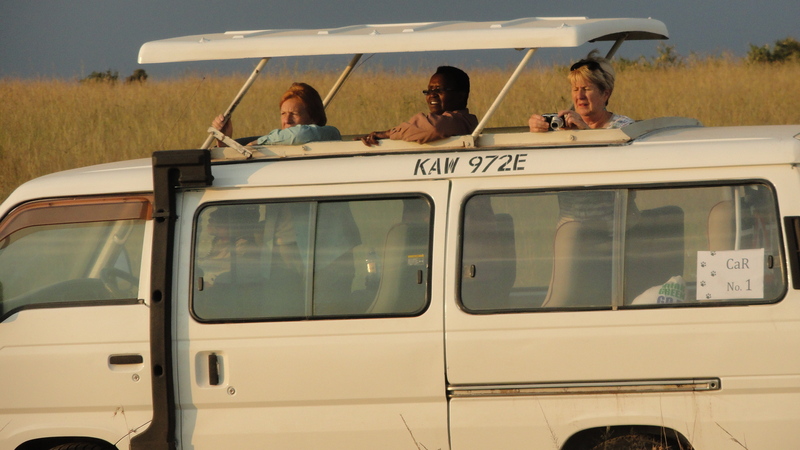 We also arranged for people to go on safari. 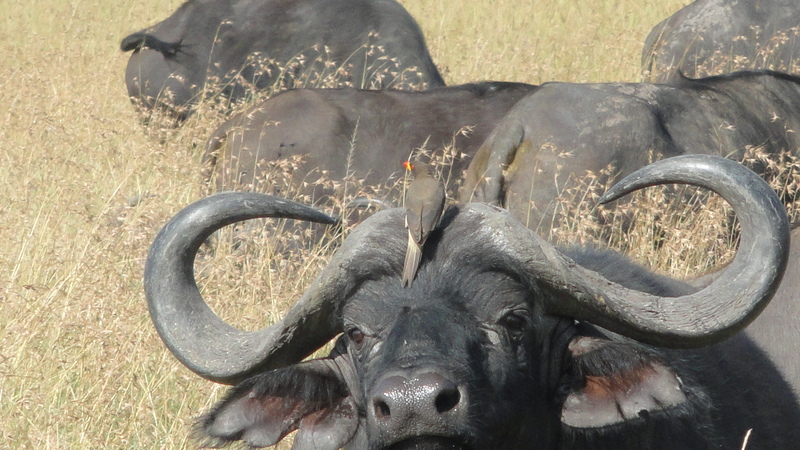 If you go to Kenya and only go on safari you haven’t really seen the country – however if you don’t go on safari you’re missing something special. 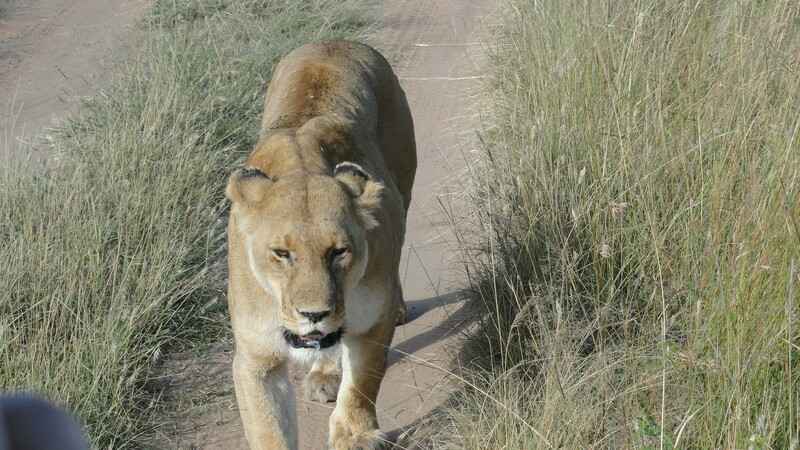 We were fortunate enough to see many of the ‘Big Five’. In all cases, every part of their trip is completely paid for by the individual – including myself and all members of my family. Never does one cent of donated money go to anything other than the program. 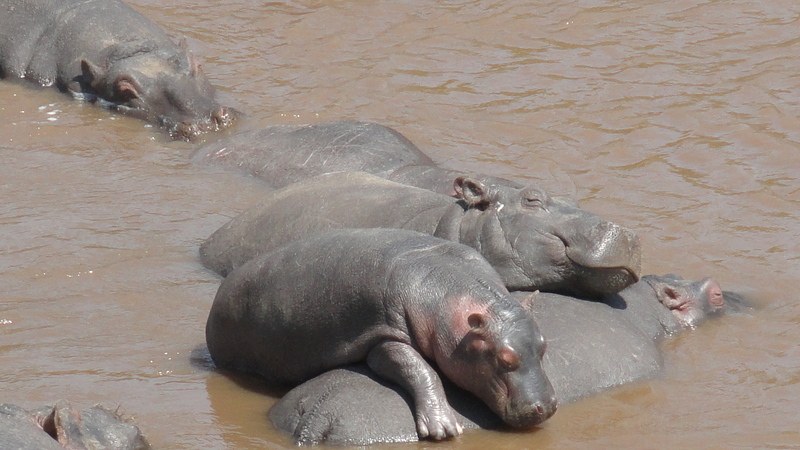 Some costs, such as staying at the Mara Simba, are expensive – at $220.00 per person per day. Others, such as staying at the Children’s Residence are relatively inexpensive. This year we charged $10.00 per person per day. This covered the cost of food and the salaries of the additional help necessary to cook and clean. While we don’t want charity money to pay for anybody’s trip we also do not want to make profit from our sponsors. Below you can see some of the projects they saw and things that they experienced and get a feeling of what our guests were participants in. If you give water you give life. Those words were spoken to me by a man who was a committee member on one of our water projects and they remain strong motivation as we continue to be involved in water projects. 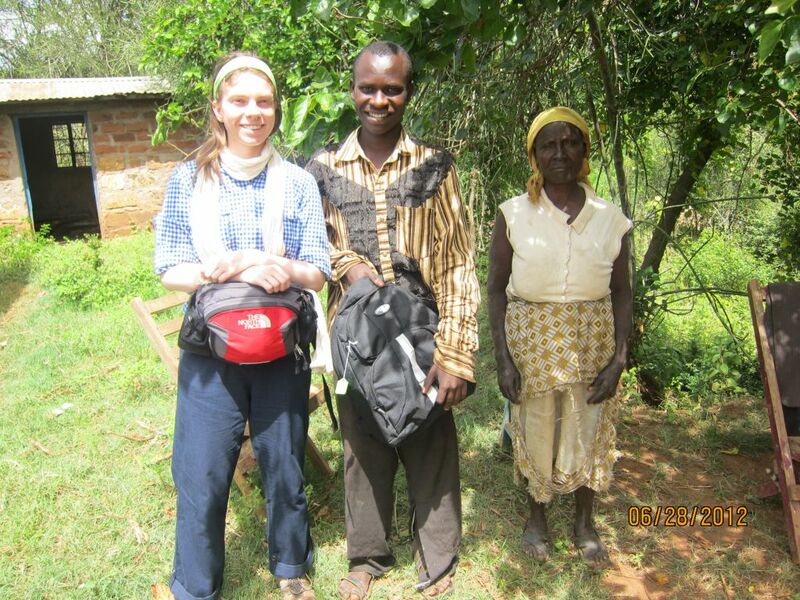 As part of our tour we brought our sponsors to what we thought was a visit to one of our projects. Instead, to our surprise, we were there for the opening. We were greeted by the members of the committee as well as other community members who worked on, and will benefit from, the project. We provided the funds to purchase cement, steel rods, pipes and hardware. The committee provided labour, sand and gravel. 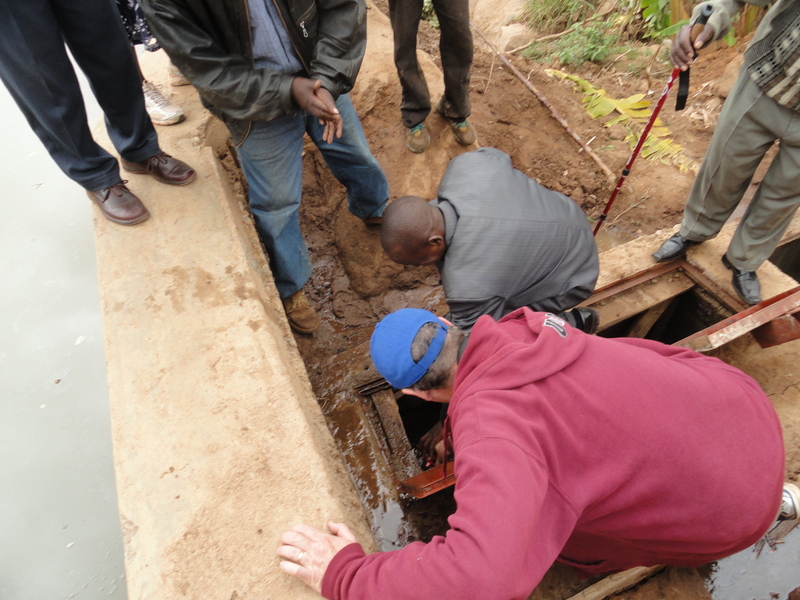 The government provided expertise in the form of a water engineer. 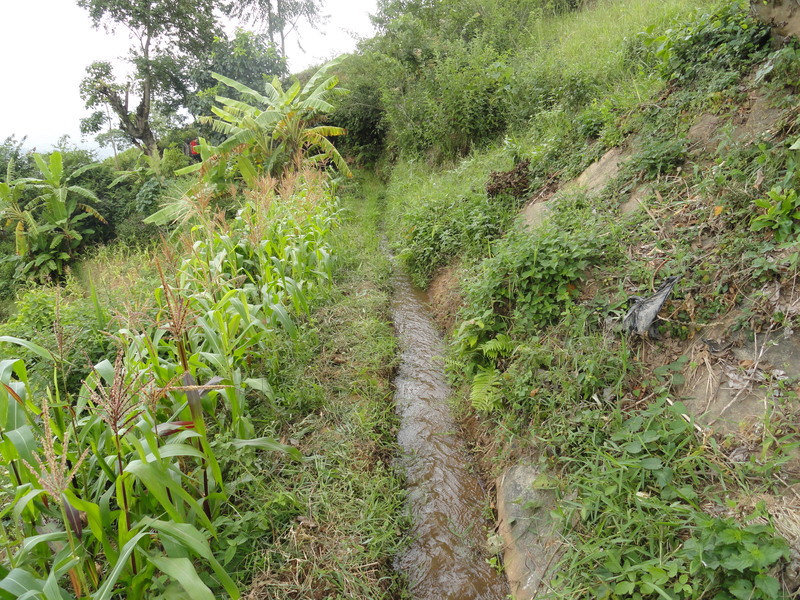 The result is a water project which provides water for irrigation, for livestock, washing and drinking for 900 people. I was there to ‘turn’ the tap, sending the water from the holding pool to the fields below. Through a series of furrows, channels and pipes the water is diverted from terrace to terrace irrigating each successive plot of land. 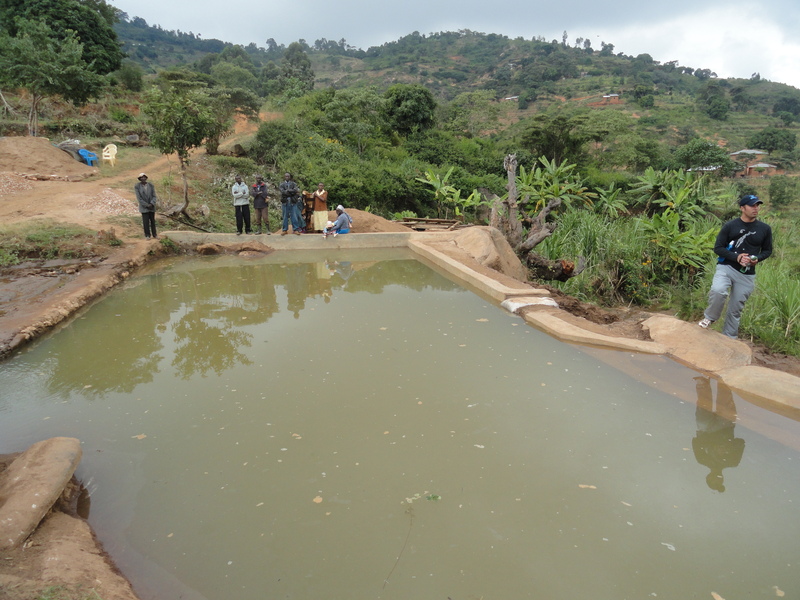 The community cooperates on how the water is shared and work together to benefit the entire community. They estimate that this project will result in the ability to double or triple crops. In addition, the local level of government is so pleased that they have offered their agricultural officer to work with the people to introduce different and hybrid crops. They also have a schedule for maintenance and to provide any repairs and are hoping to expand the use and minimize water loss by using more pipes. We have agreed to match their efforts – for every pipe they purchase we will purchase a second. This is an extension of the partnership. 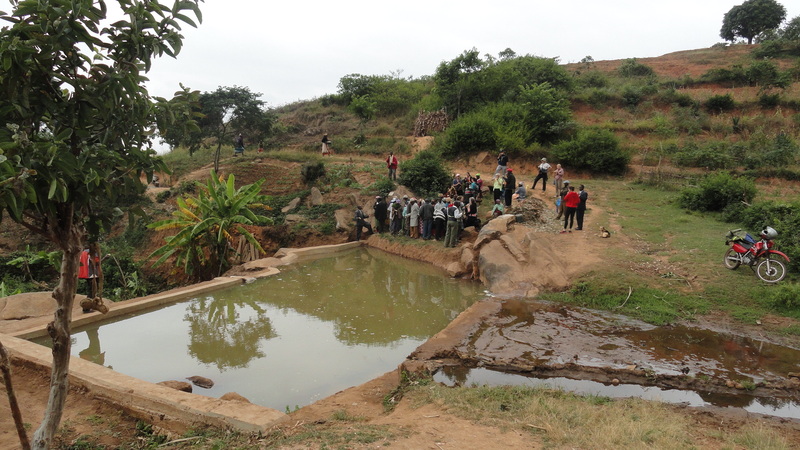 We also took our group on a tour of another water project which has continued to be improved by the local committee. 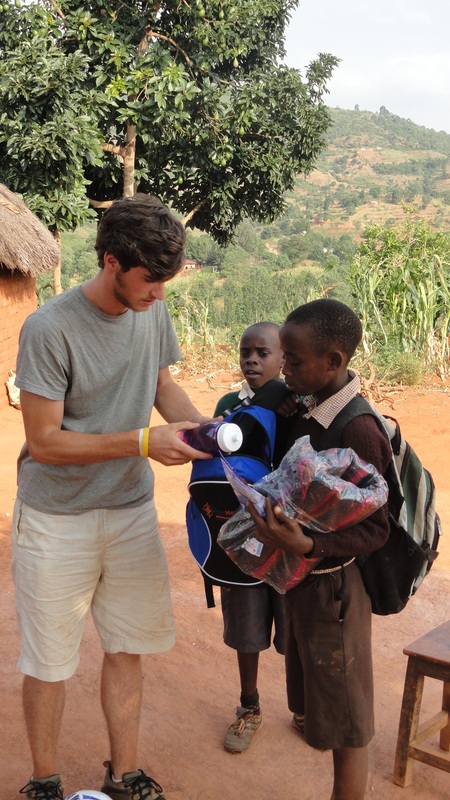 This project, which provides water for close to 800 people was funded originally by Ryan Rumsby and his class. 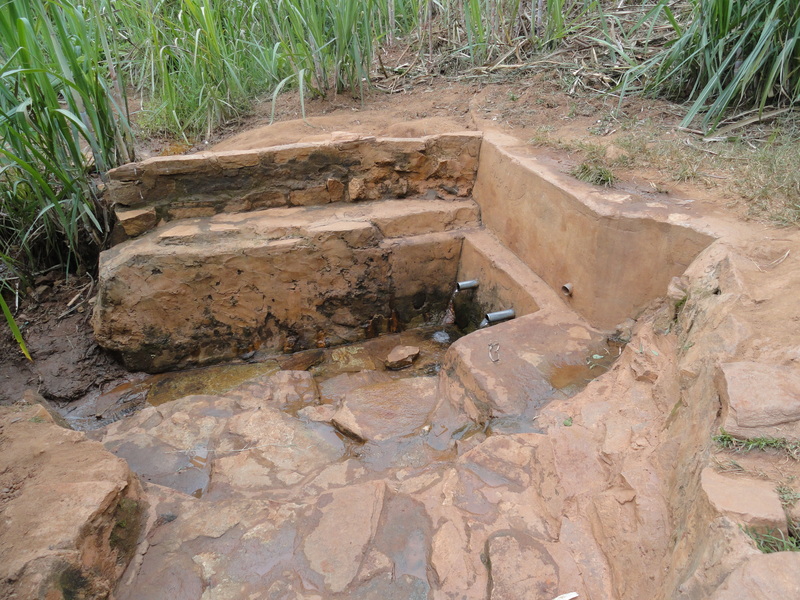 When this water source was simply a puddle in the mud the community suffered from many water-borne illnesses. They now report absolutely no water-borne diseases. Not only are they able to grow more food but these types of illness – which are devastating – have been eliminated. A third project – at the bottom of the mountain by our Children’s Home – has been continuing but at a pace slower than we would like. This project, also financially supported by the efforts of Mr. Rumsby and his class, is similar to the project immediately above. 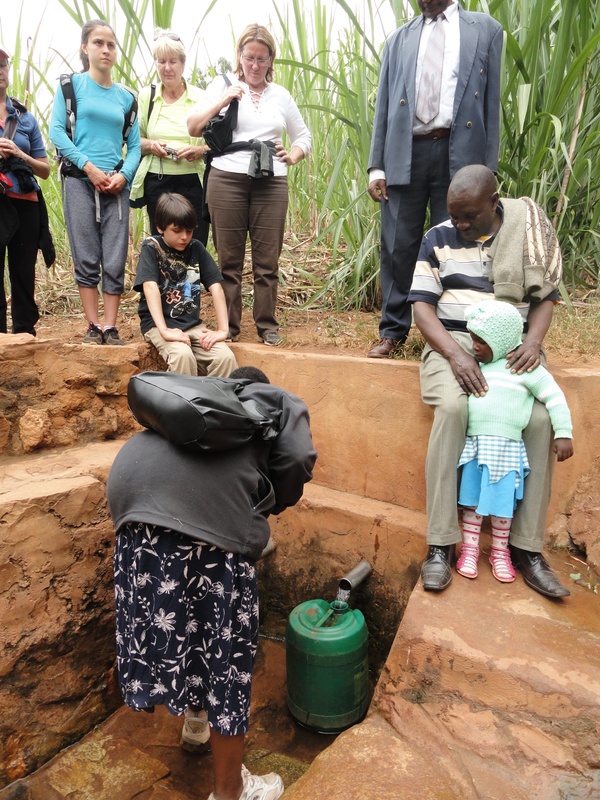 We are attempting to tap a small spring and then provide a storage tank to gather the water. 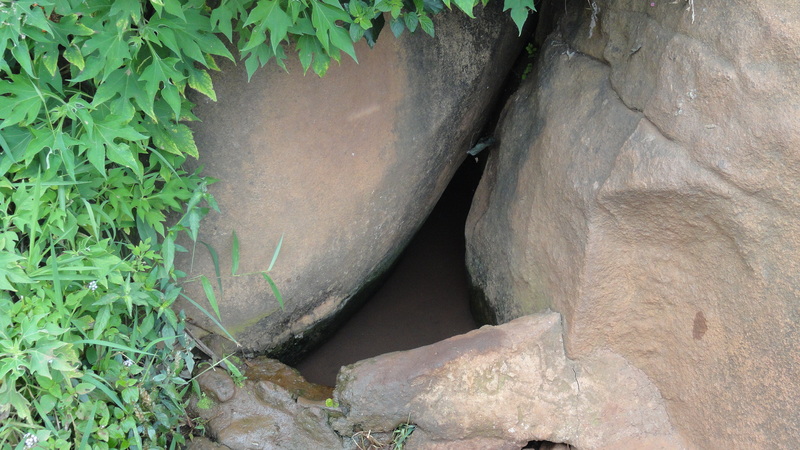 This water is gathered at source by scooping with a gourd. 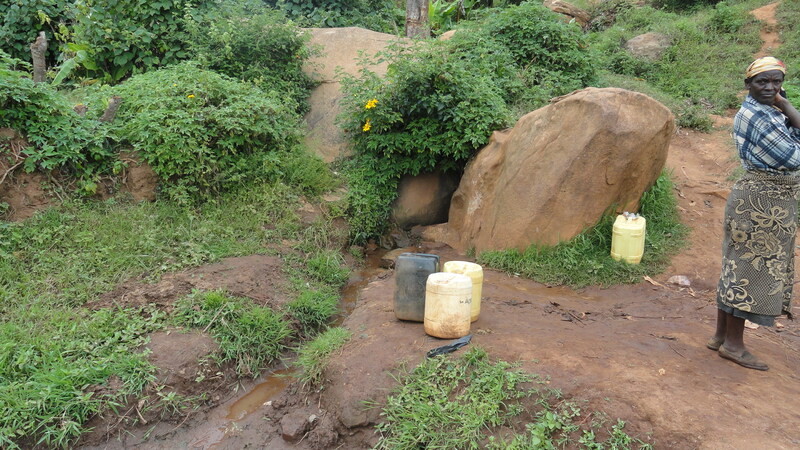 During the rainy season – which has just passed – people are occupied with their crops and the spring water is not as used or necessary. 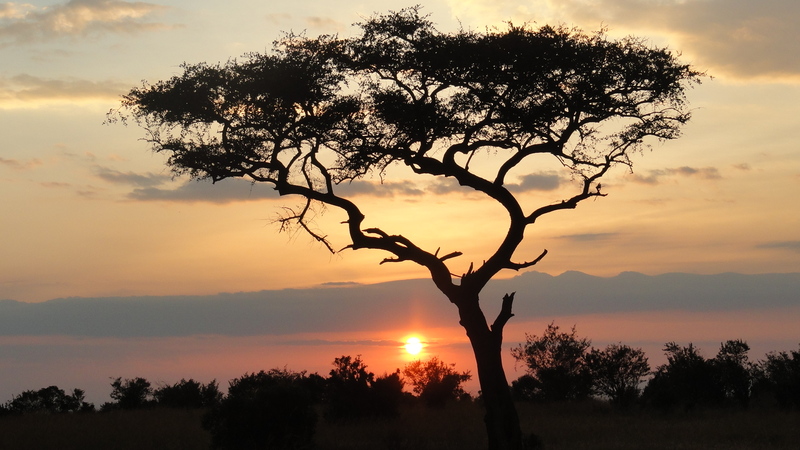 Now that the dry season has arrived we are hoping the local committee will be willing to continue to put in the work necessary to utilize the funds we have made available. As always our partnership model works when the community takes ownership for the project – sometimes this takes more time. Ruth will be taking members of this community committee on a tour of the other two projects to witness the results and talk to the other committees about mobilization of their community. 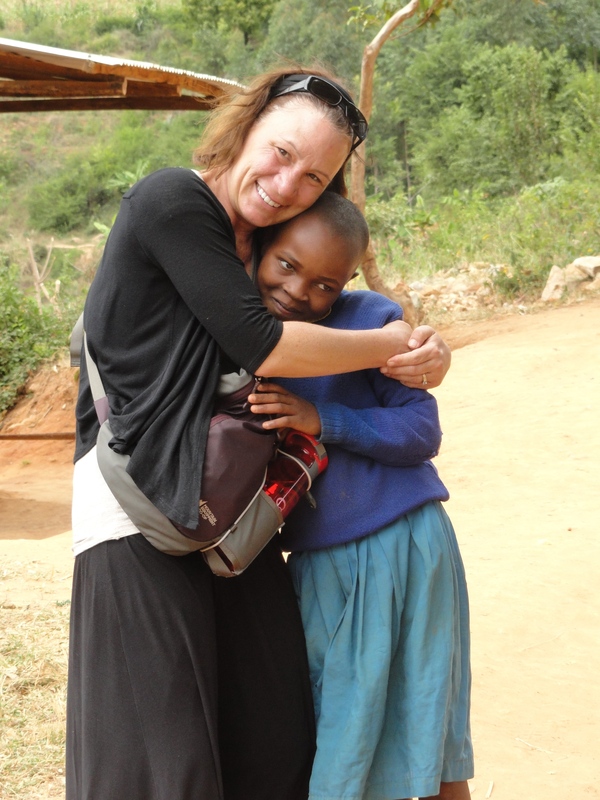 In the blog Kate wrote about walking home, she used a line that I loved, about how sponsorship is more than just providing the necessities of life, but how it allowed these children to again feel like they were part of a family – somebody’s son or daughter, brother or sister. In a society and culture so focused on family this is so important. 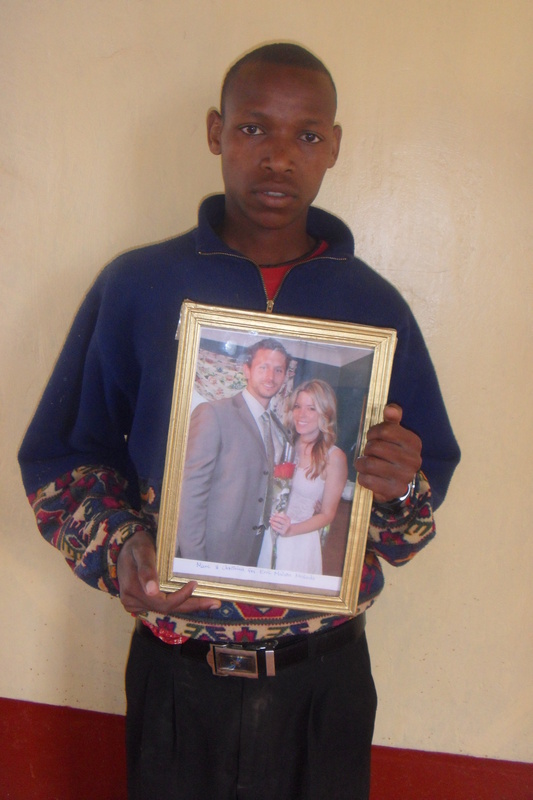 This is one of the reasons we ask sponsors to give us a picture so that their sponsored child can ‘see’ the person or people who are their new family. 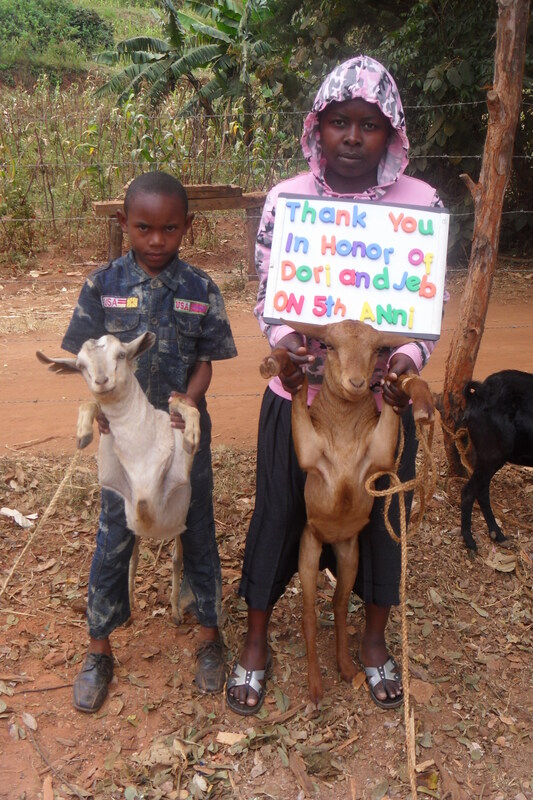 Here are two of our of our newest sponsors being ‘introduced’ to their new family members. Eric ‘meeting’ his new family – Marc and Christina. Christina is my oldest daughter and plans are underway for her and her husband Marc to meet Eric next summer. 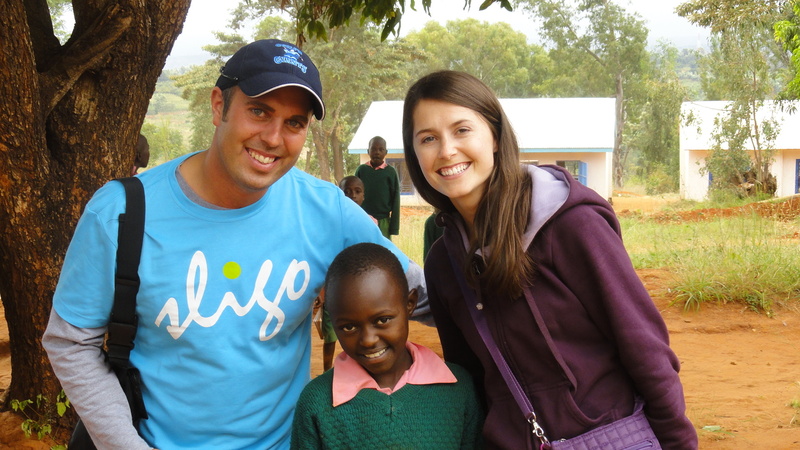 One of the greatest joys for me this summer was being there to introduce orphans to their sponsors. Kate meeting ALL of her kids – the children she taught! 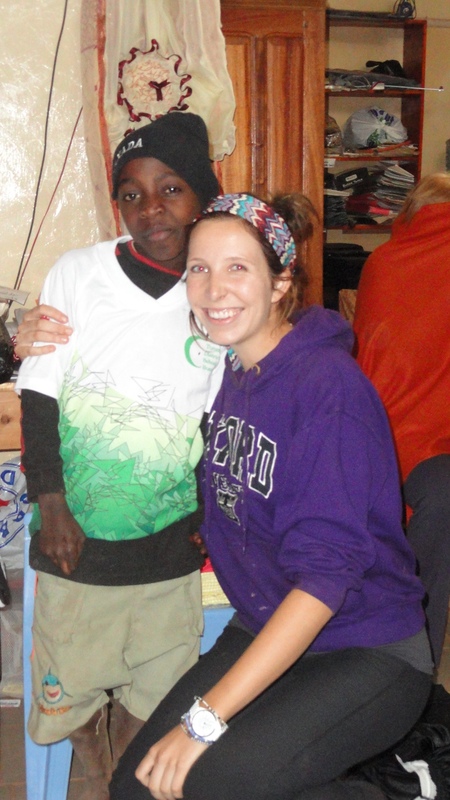 Julia spending time with Baraka – meeting him again! My wife Anita meeting Mary for the first time! 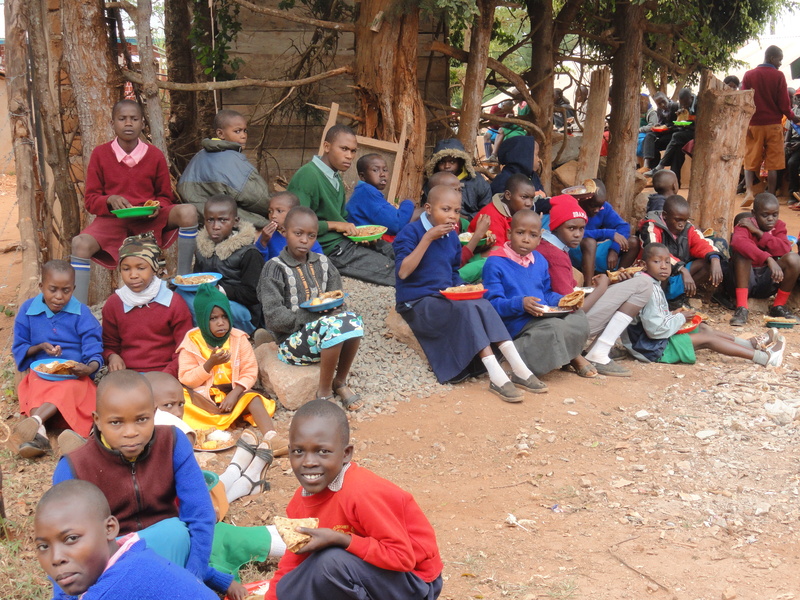 While there is still much construction needed to completely finish the building, it is already in use for the boys, and the dining hall and kitchen are complete and in use. While we were there on our trip the committee decided to have the ‘official’ opening of the new building. This was a joyous occasion that involved all of the committee members, the Bishop who did the blessing of the building, and local government officials as well as all of the children from the school. There were speeches, songs, and a meal for all. The girls will soon take up residence on the next floor, leaving only the conference area, the offices and library to be completed. 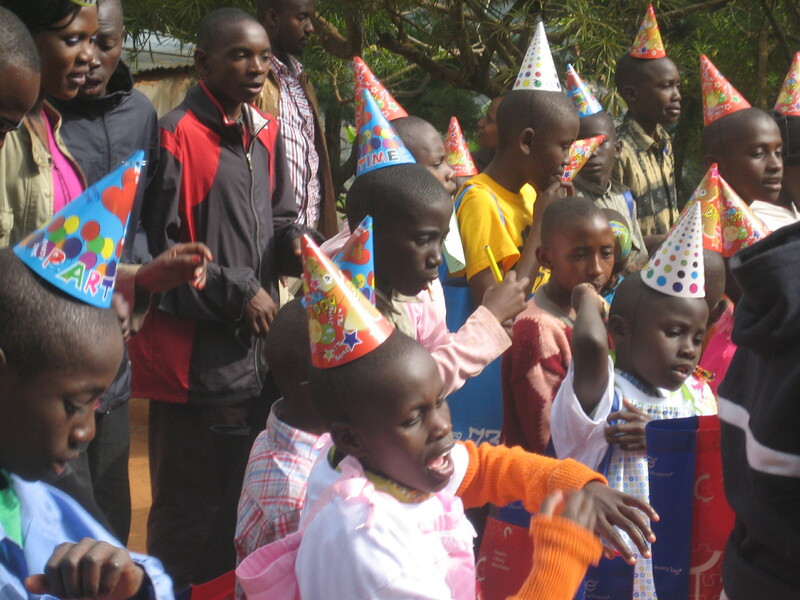 We started a tradition last year holding a birthday party for 90 children. The first party was sponsored by Rolling Hills school. 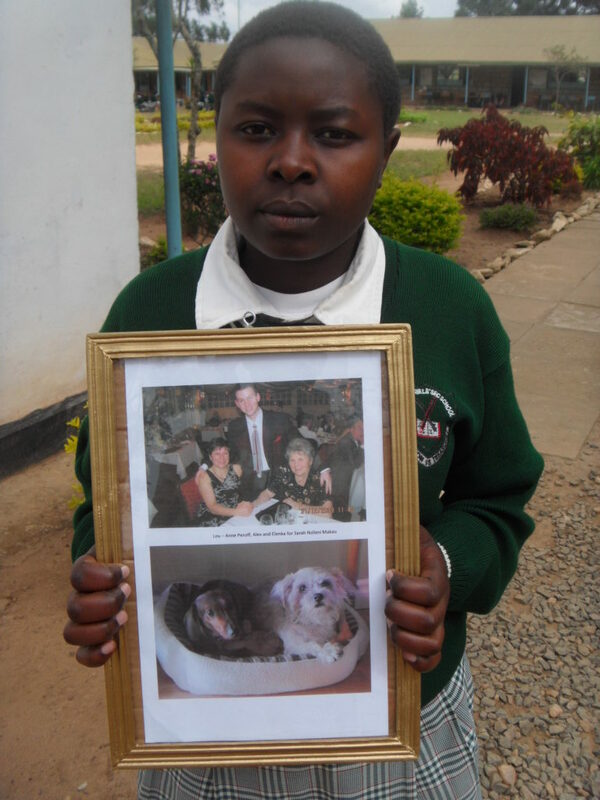 Many of our children do not know their birth dates as they were orphaned when they were very young. We decided that we wanted them to not only see their date of birth as a joyous occasion but to be in a position where we could obtain a birth certificate for each child. This year’s party was for 140 children! 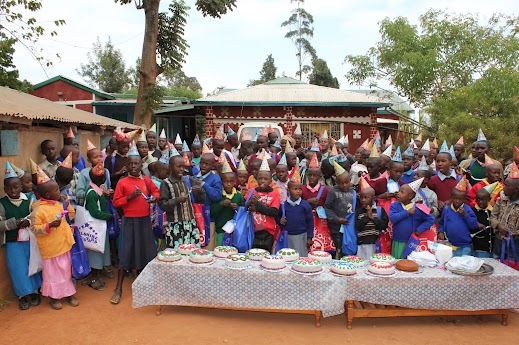 Each received a ‘loot bag’ filled with items appropriate for their age and gender (school supplies, toys, clothing, pens and pencils, stuffed animals, candy, personal items), a party hat, cake, and a guarantee that we would work to obtain a birth certificate for each child who previously did not have one. With a birth certificate they are guaranteed rights which could have been ignored. 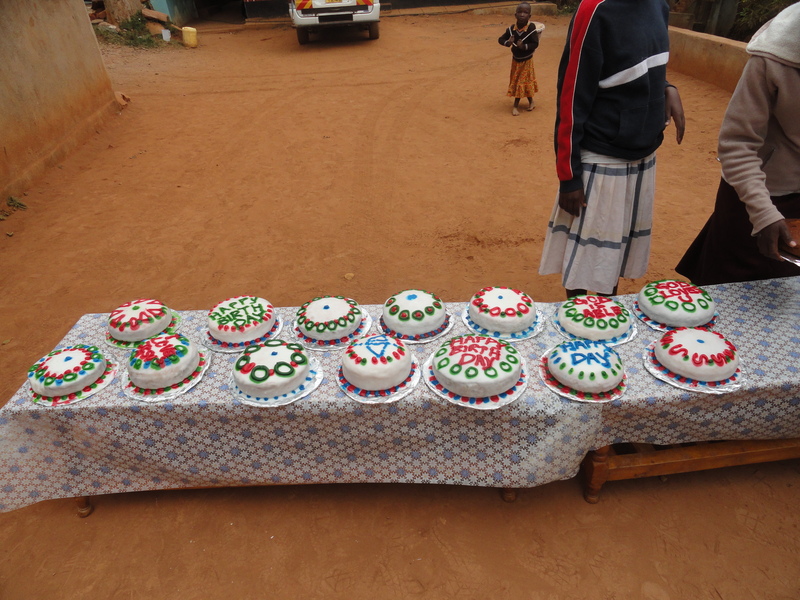 The cakes were baked in the ovens of our new residence and there was enough for all of the party guests which included hundreds of grandmothers, grandfathers and guardians. Singing Happy Birthday to Me! 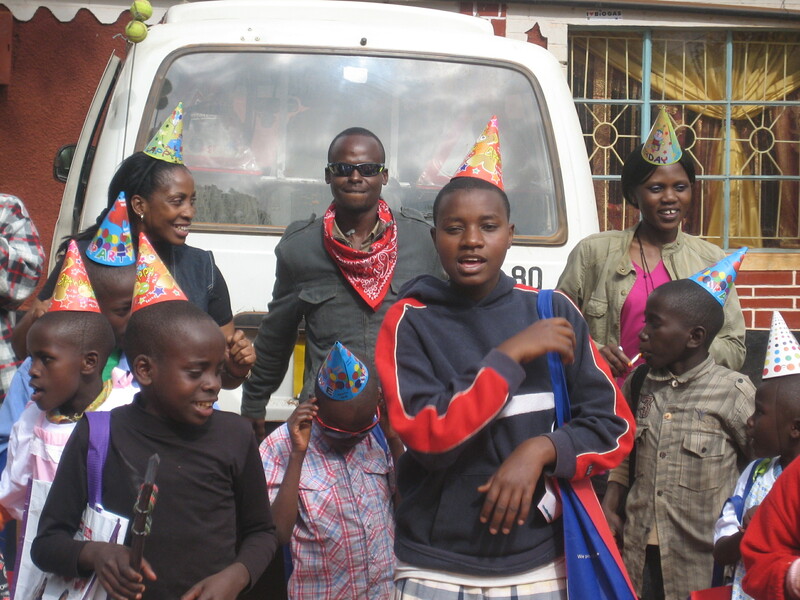 The birthday party was part of our monthly distribution day. Orphans and their guardians either walk or are transported to the site of the Children’s residence where they receive monthly food packages. These packages, totaling over 2 tons of food, provide the basic staples to support the orphan – and assist the extended family and other orphans in the homestead – for that month. They contain rice, beans, maize, cooking oil, soap, meat, salt, sugar, cocoa in addition to other items. This month close to 300 people were in attendance. 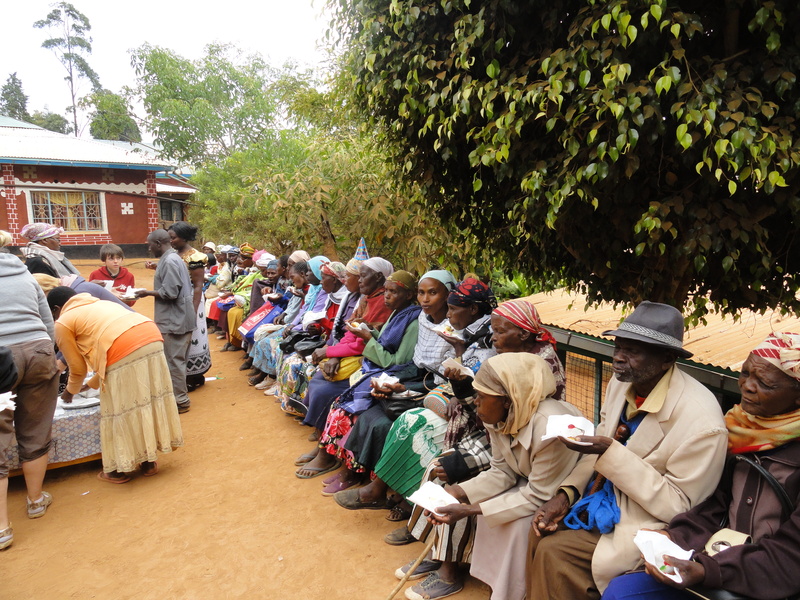 As always everybody at the distribution – children, guardians, extended family – are fed a meal. 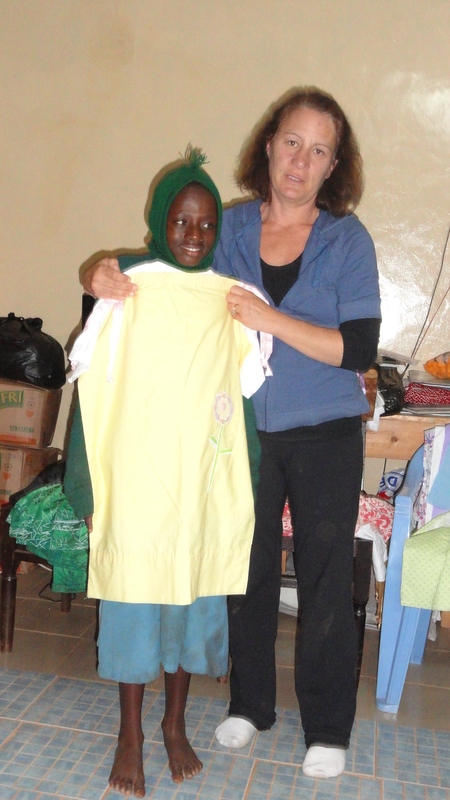 As well as food, other items are always given out including school uniforms, goats, chickens, beds, mattresses and tool sets. 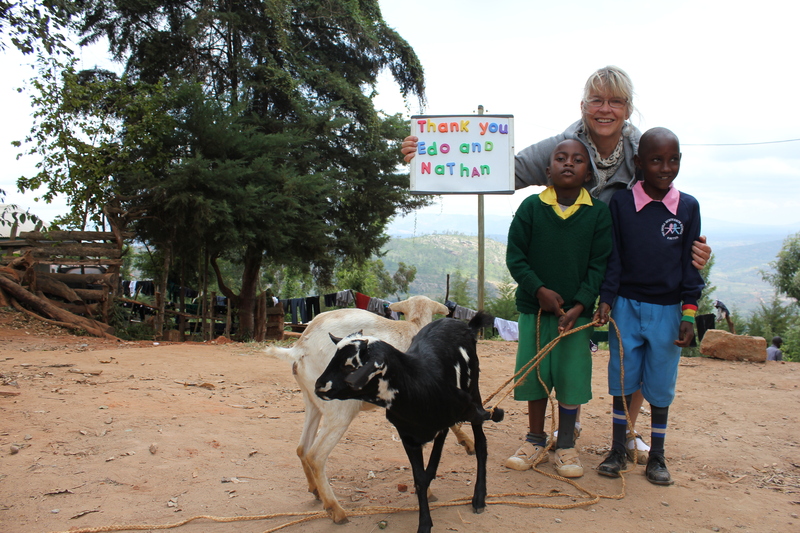 Here are some the goats – I love giving away goats! 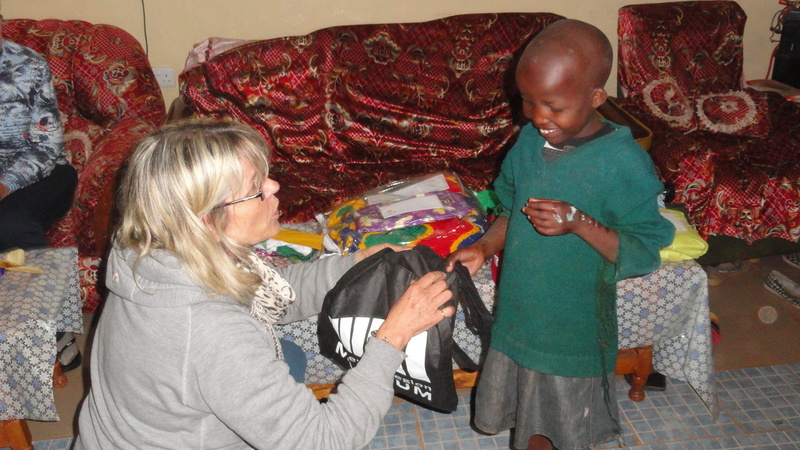 As always we try for a level of accountability – the sponsors get to see the items in the hands of the children they sponsor. 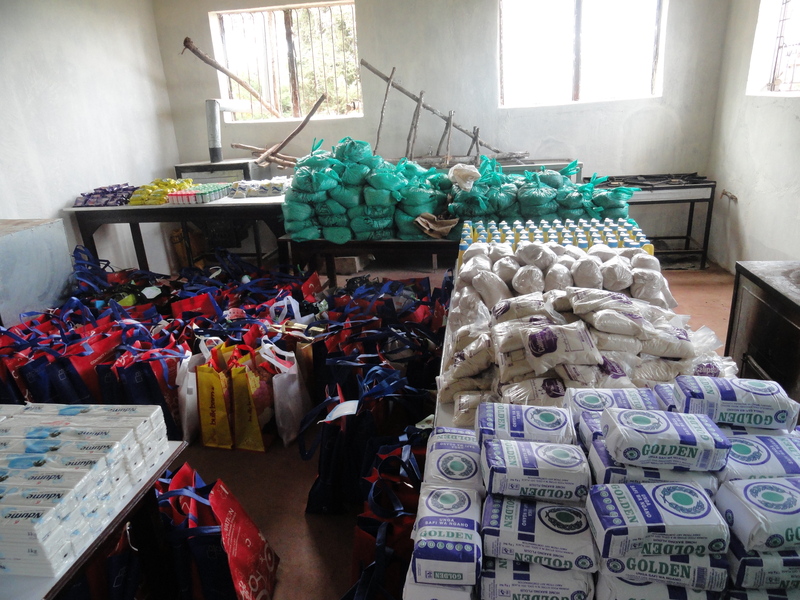 Here are a few pictures – sponsors have already been sent the picture by email of all those presents being given. 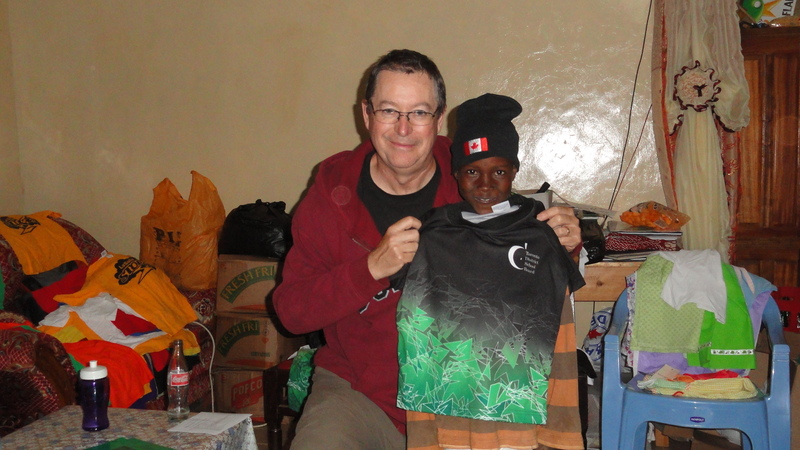 The trip was a powerful experience for both the Canadians who visited and the orphans, the Kyatha family and others running the project. We give thanks that all went safely, smoothly and successfully, building memories and relationships for all.